MARCUS PARK was born 26 October 1841 in Amsterdam, Holland. He married HIJNTJE DUKKER 10 April 1861 in Amsterdam, Holland, daughter of SALOMON DRUKKER and MIETJE DE WOLF. She was born 30 April 1841 in Amsterdam, Holland. How are you related to Marcus Park and Hijntje Dukker? 1. DAVID PARK, b. Amsterdam, Holland; d. 19 July 1886, Nieuwer-Amstel, Holland. 2. REBECCA PARK, b. 06 July 1866, Amsterdam, Holland; d. 12 October 1942, Amsterdam, Holland. 3. HARTOG PARK, b. 11 December 1869, Amsterdam, Holland; d. 11 December 1942, Auschwitz concentration camp, Poland - Holocaust victim. 4. VROUWTJE PARK, b. 26 February 1873, Amsterdam, Holland; d. 05 October 1942, Auschwitz concentration camp, Poland - Holocaust victim. Resided with sister, Mietje Park, February 1941: Tilanusstraat 79 I, Amsterdam, Holland. 5. MIETJE PARK, b. 26 June 1877, Amsterdam, Holland; d. 05 October 1942, Auschwitz concentration camp, Poland - Holocaust victim; m. MEIJER LOONSTIJN, 07 March 1918, Amsterdam, Holland; b. 20 May 1888, Amsterdam, Holland; d. 02 February 1940, Amsterdam, Holland. Resided, February 1941: Tilanusstraat 79 I, Amsterdam, Holland. 6. JETJE PARK, b. 02 March 1879, Amsterdam, Holland; d. 12 October 1942, Auschwitz III, aka Monowitz concentration camp, Oswiecim Poland – Holocaust victim. REBECCA PARK was born 06 July 1866 in Amsterdam, Holland, and died 12 October 1942 in Amsterdam, Holland. She married LEVIE MATTEMAN 22 May 1895 in Amsterdam, Holland, son of BAREND MATTEMAN and ELSJE HOFMAN. He was born 14 March 1866 in Amsterdam, Holland, and died 26 March 1943 in Sobibor death camp, Poland - Holocaust victim. Resided with wife, February 1941: Pieter Lod. Takstraat 22 I, Amsterdam, Holland. 1. ELSJE MATTEMAN was born 27 June 1897 in Amsterdam, Holland, and died 28 February 1945 in Central Europe, Municipality unknown - Holocaust victim. She married ASSER GOUDSMIT 26 January 1938 in Amsterdam, Holland, son of EZRA GOUDSMID and ROOSJE NIJKERK. He was born 29 June 1893 in Amsterdam, Holland, and died 30 September 1944 in Auschwitz concentration camp, Poland - Holocaust victim. Resided with wife, February 1941: Nieuwe Herengracht 31, Amsterdam, Holland. 2. MARCUS MATTEMAN, b. 07 October 1898, Amsterdam, Holland. 3. BAREND MATTEMAN was born 20 November 1900 in Amsterdam, Holland, and died 31 March 1944 in Central Europe, Municipality unknown - Holocaust victim. He married FEMMA BONN 03 January 1940 in Amsterdam, Holland, daughter of MARCUS BONN and BETJE POLAK. She was born 15 April 1910 in Amsterdam, Holland, and died 02 November 1942 in Auschwitz concentration camp, Poland - Holocaust victim. Resided: Pretoriusplein 10 II, Amsterdam, Holland. Parents of Femma Bonn were MARCUS BONN born 12 April 1886 in Amsterdam, Holland, and died 17 September 1942 in Auschwitz concentration camp, Poland - Holocaust victim. He married BETJE POLAK 30 June 1909 in Amsterdam, Holland. She was born 20 August 1885 in Amsterdam, Holland, and died 25 January 1943 in Auschwitz concentration camp, Poland - Holocaust victim. Resided with family, February 1941: Beukenweg 15 I, Amsterdam, Holland. HARTOG PARK was born 11 December 1869 in Amsterdam, Holland, and died 11 December 1942 in Auschwitz concentration camp, Poland - Holocaust victim. He married (1) DEBORA PLATVOET 06 February 1895 in Amsterdam, Holland, daughter of MOZES PLATVOET and SAARTJE HARINGMAN. She was born 15 September 1864 in Amsterdam, Holland, and died 06 February 1907 in Amsterdam, Holland. He married (2) REBECCA PLATVOET 22 May 1907 in Amsterdam, Holland, daughter of MOZES PLATVOET and SAARTJE HARINGMAN. She was born 24 August 1866 in Amsterdam, Holland, and died 11 December 1942 in Apeldoorn, Gelderland, Holland. Resided with family, February 1941:Rapenburgerstraat 43 I, Amsterdam, Holland. 1. HEINTJE PARK, b. 12 April 1895, Amsterdam, Holland; d. 28 September 1942, Auschwitz concentration camp, Poland - Holocaust victim. 2. MARCUS PARK, b. 04 June 1898, Amsterdam, Holland; d. 30 September 1942, Auschwitz concentration camp, Poland - Holocaust victim. 3. RIKA PARK, b. 14 May 1903, Amsterdam, Holland; d. 28 July 1906, Amsterdam, Holland. 4. ABRAHAM PARK, b. 17 September 1905, Amsterdam, Holland; d. 26 March 1943, Sobibor death camp, Poland - Holocaust victim. JETJE PARK was born 02 March 1879 in Amsterdam, Holland, and died 12 October 1942 in Auschwitz III, aka Monowitz concentration camp, Oswiecim Poland – Holocaust victim. She married DAVID KRIEKER 26 October 1911 in Zaandam, Holland, son of SALOMON KRIEKER and REBEKKA WAGENHUIJZEN. He was born 07 May 1883 in Amsterdam, Holland, and died 12 October 1942 in Auschwitz III, aka Monowitz concentration camp, Oswiecim Poland – Holocaust victim. 1. HENDRIKA KRIEKER, b. 27 November 1912, Amsterdam, Holland; d. 05 November 1942, Auschwitz concentration camp, Poland - Holocaust victim. 2. SALOMON KRIEKER, b. 21 January 1915, Amsterdam, Holland; d. 30 September 1942, Auschwitz concentration camp, Poland - Holocaust victim. a statement dated 18 July 1941 that Salomon Krieker had attended an electric welding course. 3. SAMUEL KRIEKER was born 19 December 1917 in Amsterdam, Holland, and died 31 December 1942 in Auschwitz concentration camp, Oswiecim Poland – Holocaust victim. He married ANNA HAMBURG 23 April 1941 in Amsterdam, Holland, daughter of LOUIS HAMBURG and ROSA DE LEON. She was born 04 April 1917 in Amsterdam, Holland, and died 21 September 1942 in Auschwitz concentration camp, Oswiecim Poland – Holocaust victim. Parents of Anna Hamburg were LOUIS HAMBURG born 27 October 1877 in Amsterdam, Holland, and died 19 November 1943 in Auschwitz concentration camp, Oswiecim Poland – Holocaust victim. He married ROSA DE LEON 22 March 1900 in Amsterdam, Holland, daughter of JACOB DE LEON and RAATJE STODEL. She was born 09 July 1879 in Amsterdam, Holland, and died 19 November 1943 in Auschwitz concentration camp, Oswiecim Poland – Holocaust victim. MARCUS MATTEMAN was born 07 October 1898 in Amsterdam, Holland. He married JOSEFINE VAN DER WOUDE 07 January 1925 in Amsterdam, Holland, daughter of GARCON WOUDE and KAATJE KRANT. She was born 01 March 1903 in Amsterdam, Holland, and died 24 September 1943 in Auschwitz concentration camp, Poland - Holocaust victim. Marcus Matteman died before the war. Resided with son, April 1942: Schieweg 65 a, Rotterdam, Holland. 1. GARCON MATTEMAN, b. 05 July 1931, Amsterdam, Holland; d. 24 September 1943, Auschwitz concentration camp, Poland - Holocaust victim. HEINTJE PARK was born 12 April 1895 in Amsterdam, Holland, and died 28 September 1942 in Auschwitz concentration camp, Poland - Holocaust victim. She married JOSEPH POLAK 22 January 1919 in Amsterdam, Holland, son of JOSEPH POLAK and SARA DEGEN. He was born 10 March 1897 in Amsterdam, Holland, and died 31 January 1943 in Auschwitz concentration camp, Poland - Holocaust victim. Resided with family, February 1941: Rapenburgerstraat 58 a - I, Amsterdam, Holland. 1. HARTOG POLAK, b. 01 December 1919, Amsterdam, Holland; d. 30 September 1942, Auschwitz concentration camp, Poland - Holocaust victim. 2. SARA POLAK, b. 20 February 1921, Amsterdam, Holland; d. 28 September 1942, Auschwitz concentration camp, Poland - Holocaust victim. Sara Polak worked in October 1941 as a seamstress with the lingerie- and ready-made clothing company SIDVA (Simon de Vries Ateliers) in Amsterdam. She then had been in office for two years. 3. LOUIS POLAK, b. 20 April 1928, Amsterdam, Holland; d. 28 September 1942, Auschwitz concentration camp, Poland - Holocaust victim. 4. DEBORA POLAK, b. 22 April 1935, Amsterdam, Holland; d. 28 September 1942, Auschwitz concentration camp, Poland - Holocaust victim. Survived the war by going into hiding with his wife for two years. HENDRIKA KRIEKER was born 27 November 1912 in Amsterdam, Holland, and died 05 November 1942 in Auschwitz concentration camp, Poland - Holocaust victim. She married MOZES (MAX) HENSELEIN 01 May 1935 in Amsterdam, Holland, son of ABRAHAM HENSELEIN and KLARA POLAK. 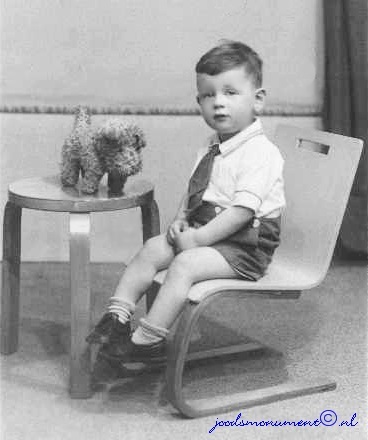 He was born 12 October 1909 in Amsterdam, Holland, and died 21 January 1945 in Blechhammer: Sub-camp of Auschwitz III - Monowitz, Poland - Holocaust victim. Resided with family, February 1941: Tilanusstraat 79 I, Amsterdam, Holland. Parents of Mozes (Max) Henselein were ABRAHAM HENSELEIN born 13 September 1868 in Mijdrecht, De Ronde Venen, Utrecht, Holland, and died 02 April 1943 in Sobibor death camp, Poland - Holocaust victim and KLARA POLAK, He married (1) KLARA POLAK 24 May 1894 in Amsterdam, Holland. She was born 02 July 1871 in Amsterdam, Holland, and died 23 December 1911 in Amsterdam, Holland. He married (2) ROOSJE POLAK 28 January 1914 in Amsterdam, Holland. She was born 04 September 1873 in Amsterdam, Holland, and died 12 April 1930 in Amsterdam, Holland. Resided: Eemsstraat 42, Amsterdam, Holland. 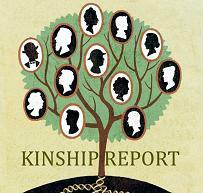 The wives of Abraham Henselein, Roosje Polak and Klara Polak, were first cousins. Mozes Henselein and his family, Amsterdam. Bedroom and alcove: lace curtain (4), drape (2), hanging lamp (2), table lamp, stone figure, double bed with bedding and spread, bedside cabinet with glass top ,bedside cabinet with doily,table with doily,chair (2), stool,dressing table with mirror and glass top, toiletries,serving trolley,mat (3), floorcloth,wardrobe, wall plate (3), standing lamp,table with cloth ,fruit bowl, chair (2), armchair,cushion (2), small stool, cot with bedding, travelling case, Verto carpet, Mat, wall cupboard (on left), shoes,ladies' and gents' clothing, worthless items. 1. ABRAHAM HENSELEIN, b. 22 October 1935, Amsterdam, Holland; d. 05 November 1942, Auschwitz concentration camp, Poland - Holocaust victim. MOZES DE WOLF was born 09 January 1852 in Amsterdam, Holland, and died 07 September 1927 in Amsterdam, Holland. He married TRIJNTJE POLAK 15 December 1875 in Amsterdam, Holland, daughter of ISAAC POLAK and SARA BEEKMAN. She was born 03 May 1851 in Amsterdam, Holland. How are you related to Mozes de Wolf? 1. NATHAN DE WOLF, m. ANTONIA JOHANNA LOCHTENBERG, 08 May 1918, Amsterdam, Holland. 2. ISAAC DE WOLF, b. 06 August 1876, Amsterdam, Holland; d. 05 February 1943, Auschwitz concentration camp, Poland - Holocaust victim. 3. EMANUEL DE WOLF, b. 25 August 1878, Amsterdam, Holland; d. 28 September 1942, Auschwitz concentration camp, Poland - Holocaust victim. 4. MIETJE DE WOLF, b. 12 June 1882, Amsterdam, Holland. 5. JACOB DE WOLF, b. 19 July 1884, Amsterdam, Holland; d. 05 February 1943, Auschwitz concentration camp, Poland - Holocaust victim. 6. VROUWTJE DE WOLF, b. 17 June 1886, Amsterdam, Holland; d. 09 August 1942, Auschwitz concentration camp, Poland - Holocaust victim; m. JACOB SPEIJER, 17 March 1920, Amsterdam, Holland; b. 14 May 1892, Amsterdam, Holland; d. 30 September 1942, Auschwitz concentration camp, Poland - Holocaust victim. Resided with family, February 1941: Joubertstraat 23 huis, Amsterdam, Holland. On the transport list of August 7, 1942, three persons who went voluntarily to Auschwitz are listed. These are people who did not want to leave their beloved ones alone. Among the volunteers is also Jacob Speijer, born on May 14, 1892. Deportation from Westerbork, August 7, 1942. 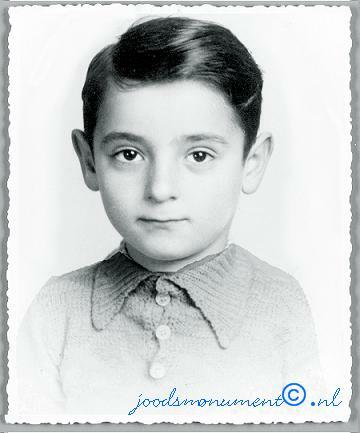 Died: August 9, 1942, in Auschwitz. 7. BETJE DE WOLF, b. 23 February 1890, Amsterdam, Holland; d. 03 November 1918, Amsterdam, Holland. 8. MEIJER DE WOLF, b. 23 February 1890, Amsterdam, Holland; d. 04 December 1963, Amsterdam, Holland; m. AUGUSTINA THEODORA LOCHTENBERG, 05 January 1916, Amsterdam, Holland. ISAAC DE WOLF was born 06 August 1876 in Amsterdam, Holland, and died 05 February 1943 in Auschwitz concentration camp, Poland - Holocaust victim. He married BETJE PIJNAPPEL 23 December 1896 in Amsterdam, Holland, daughter of ZADOK PIJNAPPEL and ELISABETH DE WOLF. She was born 19 June 1874 in Amsterdam, Holland, and died 26 May 1940 in Amsterdam, Holland. Resided with wife, May 1940: Eerste Oosterparkstraat 72 I, Amsterdam, Holland. 1. MOZES DE WOLF, b. 26 November 1898, Amsterdam, Holland; d. 24 November 1943, Auschwitz concentration camp, Poland - Holocaust victim. 3. ZADOK DE WOLF, b. 02 April 1901, Amsterdam, Holland; d. 04 September 1901, Amsterdam, Holland. 4. TRUITJE DE WOLF, b. 30 May 1902, Amsterdam, Holland; d. 03 September 1943, Auschwitz concentration camp, Poland - Holocaust victim. 5. JANSJE DE WOLF, b. 20 May 1904, Amsterdam, Holland; d. 28 October 1904, Amsterdam, Holland. 6. ZADOK DE WOLF, b. 29 June 1905, Amsterdam, Holland; d. 02 April 1943, Sobibor death camp, Poland - Holocaust victim. 7. VROUWTJE DE WOLF, b. 13 February 1907, Amsterdam, Holland; d. 17 September 1942, Auschwitz concentration camp, Poland - Holocaust victim. 8. BAREND DE WOLF, b. 23 December 1908, Amsterdam, Holland; d. 05 January 1909, Amsterdam, Holland. 9. EMANUEL DE WOLF, b. 23 December 1908, Amsterdam, Holland; d. 25 January 1943, Auschwitz concentration camp, Poland - Holocaust victim. 10. JANSJE DE WOLF, b. 05 December 1909, Amsterdam, Holland; d. 31 January 1944, Auschwitz concentration camp, Poland - Holocaust victim; m. ABRAHAM SLUIJS, 23 December 1931, Amsterdam, Holland; b. 16 January 1909, Amsterdam, Holland; d. 31 January 1944, Auschwitz concentration camp, Poland - Holocaust victim. Resided with wife, February 1941: Colensostraat 6 huis, Amsterdam, Holland. EMANUEL DE WOLF was born 25 August 1878 in Amsterdam, Holland, and died 28 September 1942 in Auschwitz concentration camp, Poland - Holocaust victim. He married ROOSJE BLOG 17 June 1903 in Amsterdam, Holland, daughter of WOLF BLOG and REINTJE PRESSER. She was born 27 June 1878 in Amsterdam, Holland, and died 28 September 1942 in Auschwitz concentration camp, Poland - Holocaust victim. Resided with family, February 1941: Transvaalkade 111 huis, Amsterdam, Holland. 1. MOZES DE WOLF, b. 28 October 1903, Amsterdam, Holland; d. 10 September 1943, Auschwitz concentration camp, Poland - Holocaust victim. 2. TRUITJE DE WOLF, b. 16 May 1909, Amsterdam, Holland; d. 30 September 1942, Auschwitz concentration camp, Poland - Holocaust victim. 3. REINTJE DE WOLF, b. 19 November 1916, Amsterdam, Holland; d. 30 September 1942, Auschwitz concentration camp, Poland - Holocaust victim. JACOB DE WOLF was born 19 July 1884 in Amsterdam, Holland, and died 05 February 1943 in Auschwitz concentration camp, Poland - Holocaust victim. He married (1) REBECCA BLOG 17 May 1905 in Amsterdam, Holland, daughter of WOLF BLOG and REINTJE PRESSER. She was born 23 October 1882 in Amsterdam, Holland, and died 06 May 1932 in Amsterdam, Holland. He married (2) HEINTJE ROEG 13 August 1935 in Amsterdam, Holland, daughter of NATHAN ROEG and MARGARETHA POLAK. She was born 03 April 1884 in Amsterdam, Holland, and died 05 February 1943 in Auschwitz concentration camp, Poland - Holocaust victim. Resided with family, February 1941: Valkenburgerstraat 75 II, Amsterdam, Holland. Jacob de Wolf was first married to Rebecca Blog. After she had died in 1932, he married Heintje Roeg. From the first marriage seven children were born. Two children died at a young age. The other children were: Willem, Samuel, Mozes, Gerrit and Isaak. 1. WILLEM DE WOLF, b. 24 December 1906, Amsterdam, Holland; d. 09 July 1943, Sobibor death camp, Poland - Holocaust victim. 2. SAMUEL DE WOLF, b. 14 August 1910, Amsterdam, Holland; d. 01 September 1941, Mauthausen-Gusen Concentration Camp, Mauthausen, Austria. 3. MOZES DE WOLF, b. 19 February 1912, Amsterdam, Holland; d. 28 February 1943, Auschwitz concentration camp, Poland - Holocaust victim. Resided, February 1941: Zwanenburgwal 90 II, Amsterdam, Holland. 4. GERRIT DE WOLF, b. 29 November 1917, Amsterdam, Holland; d. 04 June 1943, Sobibor death camp, Poland - Holocaust victim. Gerrit de Wolf was a son from the first marriage of his father Jacob de Wolf and Rebecca Blog. She passed away in 1932. Gerrit was unmarried and lived at home with his father and his 2nd wife Heintje Roeg at Valkenburgerstraat 75 II in Amsterdam. 5. ISAAK DE WOLF, b. 07 December 1918, Amsterdam, Holland; d. 10 August 1941, Mauthausen-Gusen Concentration Camp, Mauthausen, Austria; m. FREDERIKA SPRINGER. Resided with family, February 1941: Nieuwe Uilenburgerstraat 36 II, Amsterdam, Holland. BETJE DE WOLF was born 23 February 1890 in Amsterdam, Holland, and died 03 November 1918 in Amsterdam, Holland. She married SALOMON LEUW 02 April 1914 in Amsterdam, Holland, son of LEVIE LEUW and MINA HIEGENTLICH. He was born 25 February 1891 in Amsterdam, Holland, and died 23 July 1943 in Sobibor death camp, Poland - Holocaust victim. 1. LEVIE LEUW, b. 09 August 1914, Amsterdam, Holland; d. 30 September 1942, Auschwitz concentration camp, Poland - Holocaust victim. MOZES DE WOLF was born 26 November 1898 in Amsterdam, Holland, and died 24 November 1943 in Auschwitz concentration camp, Poland - Holocaust victim. He married FEMMINA KOSTER 26 July 1922 in Amsterdam, Holland, daughter of ALEXANDER KOSTER and FLORA BUITENKANT. She was born 21 April 1900 in Amsterdam, Holland, and died 03 September 1943 in Auschwitz concentration camp, Poland - Holocaust victim. 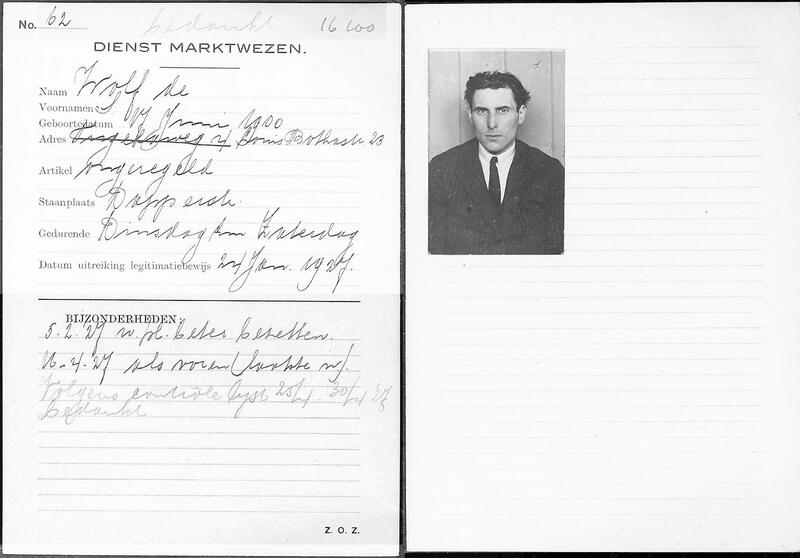 Resided with family, February 1941: Tugelaweg 33 III, Amsterdam, Holland. Parents of Femmina Koster were ALEXANDER KOSTER born 17 December 1878 in Amsterdam, Holland, and died 30 April 1943 in Sobibor death camp, Poland - Holocaust victim and FLORA BUITENKANT. He married (1) FLORA BUITENKANT 18 January 1899 in Amsterdam, Holland. She was born 06 October 1877 in London, England, and died 21 July 1935 in Amsterdam, Holland. 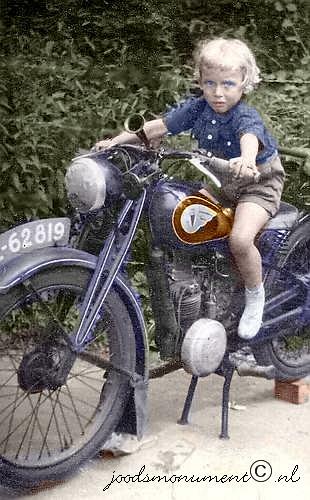 He married (2) REGINA VLEESCHHOUWER 17 July 1940 in Amsterdam, Holland. She was born 08 May 1883 in Amsterdam, Holland, and died 30 April 1943 in Sobibor death camp, Poland - Holocaust victim. Alexander Koster was a son of Hermanus Koster and Beatrix Eva de Vries. He married Flora Buitekant in 1899 in Amsterdam. She passed away in 1935. He remarried Regina Vleeschhouwer on 17 July 1940 in Amsterdam. Resided with husband, February 1941: Kromme Mijdrechtstraat 5 II, Amsterdam, Holland. 1. BETSY DE WOLF, b. 23 December 1922, Amsterdam, Holland; d. 31 January 1945, Auschwitz concentration camp, Poland - Holocaust victim. 2. FLORA DE WOLF, b. 16 June 1926, Amsterdam, Holland; d. 21 May 1943, Sobibor death camp, Poland - Holocaust victim. 3. BEATRIX EVA DE WOLF, b. 01 November 1932, Amsterdam, Holland; d. 03 September 1943, Auschwitz concentration camp, Poland - Holocaust victim. ELISABETH DE WOLF was born 12 December 1899 in Amsterdam, Holland, and died 25 April 1982 in Amsterdam, Holland. She married FRANCISCUS ANTHONIUS HAZES 06 February 1918 in Amsterdam, Holland. 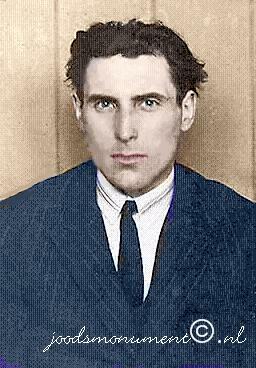 He was born 06 October 1894 in Nieuwer Amstel, Amsterdam, Holland, and died 06 September 1989 in Amsterdam, Holland. 1. IZAK HAZES, b. 07 October 1918, Amsterdam, Holland; d. 15 December 1919, Amsterdam, Holland. 5. FREDERIKA HAZES, b. 22 April 1925, Amsterdam, Holland; d. 30 September 1942, Auschwitz concentration camp, Oswiecim, Poland – Holocaust victim. TRUITJE DE WOLF was born 30 May 1902 in Amsterdam, Holland, and died 03 September 1943 in Auschwitz concentration camp, Poland - Holocaust victim. 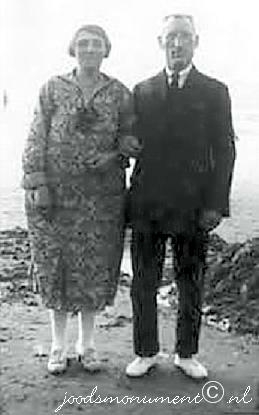 She married BENJAMIN BERLIJN 21 March 1923 in Amsterdam, Holland, son of LEVIE BERLIJN and AALTJE BERLIJN. He was born 22 March 1902 in Alkmaar, Holland, and died 30 September 1942 in Auschwitz concentration camp, Poland - Holocaust victim. Resided with family, July 1942: Tweede Oosterparkstraat 173 huis, Amsterdam, Holland. Parents of Benjamin Berlijn were LEVIE JACOB BERLIJN born 14 November 1872 in Alkmaar, Holland, and died 10 September 1942 in Auschwitz concentration camp, Poland - Holocaust victim. He married AALTJE BERLIJN 31 January 1897 in Edam, Holland. She was born 07 November 1871 in Edam, Holland, and died 10 September 1942 in Auschwitz concentration camp, Poland - Holocaust victim. Resided with wife, February 1941: Niasstraat 46 huis, Amsterdam, Holland. First cousin marriage to wife, Aaltje Berlijn. 1. LEVIE BENJAMIN BERLIJN, b. 06 November 1923, Amsterdam, Holland; d. 10 August 1942, Auschwitz concentration camp, Poland - Holocaust victim. 2. ISAAC BERLIJN, b. 26 December 1924, Amsterdam, Holland; d. 30 September 1942, Auschwitz concentration camp, Poland - Holocaust victim. 3. ALIDA BERLIJN, b. 27 January 1927, Amsterdam, Holland; d. 30 September 1942, Auschwitz concentration camp, Poland - Holocaust victim. 4. MAX BERLIJN, b. 06 April 1931, Amsterdam, Holland; d. 18 July 1942, Auschwitz concentration camp, Poland - Holocaust victim. ZADOK DE WOLF was born 29 June 1905 in Amsterdam, Holland, and died 02 April 1943 in Sobibor death camp, Poland - Holocaust victim. He married FRIEDA SCHLOCKOFF 24 May 1933 in Amsterdam, Holland. 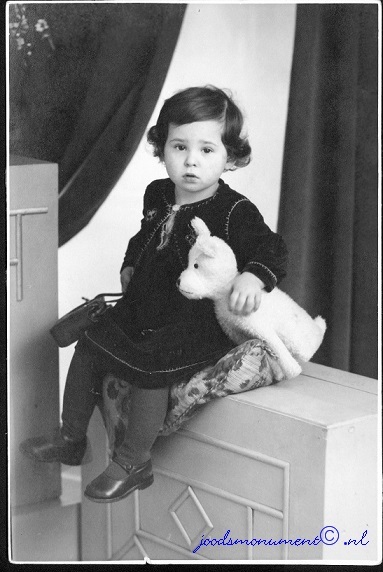 She was born 16 February 1912 in Zabrze, Silesia, Poland, and died 02 April 1943 in Sobibor death camp, Poland - Holocaust victim. Resided with family, February 1941: Benkoelenstraat 6 I, Amsterdam, Holland. 1. BETSY DE WOLF, b. 09 October 1933, Amsterdam, Holland; d. 02 April 1943, Sobibor death camp, Poland - Holocaust victim. 2. ELLA LINA DE WOLF, b. 18 December 1935, Amsterdam, Holland; d. 02 April 1943, Sobibor death camp, Poland - Holocaust victim. 3. EMANUEL DE WOLF, b. 26 November 1937, Amsterdam, Holland; d. 02 April 1943, Sobibor death camp, Poland - Holocaust victim. 4. RUDOLF DE WOLF, b. 19 September 1940, Amsterdam, Holland; d. 02 April 1943, Sobibor death camp, Poland - Holocaust victim. 5. WILLY GEORG DE WOLF, b. 12 March 1942, Amsterdam, Holland; d. 02 April 1943, Sobibor death camp, Poland - Holocaust victim. 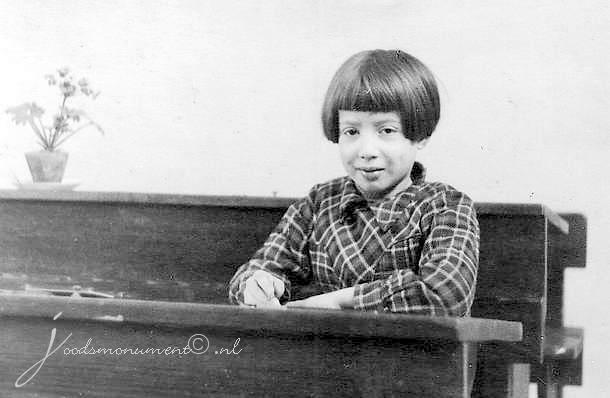 VROUWTJE DE WOLF was born 13 February 1907 in Amsterdam, Holland, and died 17 September 1942 in Auschwitz concentration camp, Poland - Holocaust victim. She married LEVIE DA COSTA DA FONCECA 12 March 1930 in Amsterdam, Holland, son of ISAAC DA FONCECA and SIENTJE LOOTJE. He was born 21 April 1906 in Amsterdam, Holland, and died 07 February 1945 in Gross-Rosen concentration camp, Rogoznica, Poland – Holocaust victim. Resided with family, February 1941: Eerste Oosterparkstraat 72 huis, Amsterdam, Holland. Parents of Levie da Costa da Fonceca were ISAAC DA COSTA DA FONCECA born 13 September 1875 in Amsterdam, Holland, and died 11 April 1938 in Amsterdam, Holland. He married SIENTJE LOOTJE 07 September 1899 in Amsterdam, Holland. She was born 12 November 1877 in Amsterdam, Holland, and died 27 August 1943 in Auschwitz concentration camp, Poland - Holocaust victim. Resided: Home for the elderly, Ruyschstraat 7 huis en bovenhuis, Amsterdam, Holland. 1. ISAAC DA COSTA DA FONCECA, b. 13 August 1933, Amsterdam, Holland; d. 17 September 1942, Auschwitz concentration camp, Poland - Holocaust victim. 2. BETSY DA COSTA DA FONCECA, b. 22 October 1935, Amsterdam, Holland; d. 17 September 1942, Auschwitz concentration camp, Poland - Holocaust victim. 3. INA DA COSTA DA FONCECA, b. 27 November 1937, Amsterdam, Holland; d. 17 September 1942, Auschwitz concentration camp, Poland - Holocaust victim. 4. ELISABETH DA COSTA DA FONCECA, b. 17 January 1941, Amsterdam, Holland; d. 17 September 1942, Auschwitz concentration camp, Poland - Holocaust victim. MOZES DE WOLF was born 28 October 1903 in Amsterdam, Holland, and died 10 September 1943 in Auschwitz concentration camp, Poland - Holocaust victim. He married BETJE GEERTRUIDA JACOBA DE BEER 10 June 1925 in Amsterdam, Holland, daughter of GERRIT DE BEER and GEERTRUIDA BUHL. She was born 15 January 1906 in Amsterdam, Holland, and died 30 November 1943 in Auschwitz concentration camp, Poland - Holocaust victim. Resided with wife, February 1941: Saenredamstraat 51 II, Amsterdam, Holland. 1. EMANUEL DE WOLF, d. 1936. WILLEM DE WOLF was born 24 December 1906 in Amsterdam, Holland, and died 09 July 1943 in Sobibor death camp, Poland - Holocaust victim. He married MEINTJE KOOL 25 October 1933 in Amsterdam, Holland, daughter of ELIAS KOOL and BETJE LUCASSE. She was born 13 March 1907 in Amsterdam, Holland, and died 11 June 1943 in Sobibor death camp, Poland - Holocaust victim. Resided with family, February 1941: Plantage Kerklaan 6 III, Amsterdam, Holland. Parents of Meintje Kool were ELIAS KOOL born 11 November 1875 in Amsterdam, Holland, and died 09 April 1943 in Sobibor death camp, Poland - Holocaust victim. He married BETJE LUCASSE 06 July 1898 in Amsterdam, Holland. She was born 16 December 1878 in Amsterdam, Holland, and died 09 April 1943 in Sobibor death camp, Poland - Holocaust victim. Resided with family, February 1941: Plantage Kerklaan 6 II, Amsterdam, Holland. Belonging to Willem de Wolf family, Amsterdam, Holland. Living room: floorcloth, Carpet, lace curtain (2), drape (2), table with cloth, chair (4), armchair (2), easy chair, hanging lamp, solid fuel oven, small statue (3), vase (2), standing clock, linen cupboard, wall cupboard (2), Living room (overlooking the street): floorcloth, carpet, lace curtain (3), drape (6), hanging lamp, small statue (4), table,chair (4), easy chair (2), divan with cover, flower table with cover, table lamp, cot with accessories, sideboard, wall cupboard (2), Alcove: floorcloth, runner, small carpet, hanging lamp, double bedstead with accessories, chair (2),newspaper holder. Kitchen: floorcloth, mat (2), lace curtain (2), table, chair, gas ring, electric iron, shelf with pans (2), wall mirror, cupboard. Corridor 2: floorcloth, runner (2), coat hooks, mat, attic, child seat, coal-scuttle, chair (2), worthless items. 1. JACOB DE WOLF, b. 31 December 1935, Amsterdam, Holland; d. 09 July 1943, Sobibor death camp, Poland - Holocaust victim. Jacob de Wolf was deported to Sobibor in June 1943 from Vught via Westerbork on the so-called children's transport. He was 7 years old when he died. SAMUEL DE WOLF was born 14 August 1910 in Amsterdam, Holland, and died 01 September 1941 in Mauthausen-Gusen Concentration Camp, Mauthausen, Austria. He married KAATJE PRONT 15 May 1929 in Amsterdam, Holland, daughter of MANUS PRONT and JUDITH VAN NOORD. She was born 03 June 1911 in Amsterdam, Holland, and died 21 September 1942 in Auschwitz concentration camp, Poland - Holocaust victim. Resided with family, February 1941: Lange Houtstraat 24 a - III, Amsterdam, Holland. Parents of Kaatje Pront were MANUS PRONT born 05 June 1873 in Amsterdam, Holland, and died 01 February 1943 in Auschwitz concentration camp, Poland - Holocaust victim. He married JUDITH VAN NOORD 22 July 1896 in Amsterdam, Holland. She was born 25 February 1876 in Amsterdam, Holland, and died 22 January 1942 in Amsterdam, Holland. Resided with family, February 1941: Rapenburgerstraat 65 II, Amsterdam, Holland. Burial: 25 January 1942, Dieman cemetary, Holland. 1. JACOB DE WOLF, b. 14 July 1929, Amsterdam, Holland; d. 21 September 1942, Auschwitz concentration camp, Poland - Holocaust victim. 2. GRETA DE WOLF, b. 01 July 1930, Amsterdam, Holland; d. 21 September 1942, Auschwitz concentration camp, Poland - Holocaust victim. 3. REBECCA DE WOLF, b. 28 March 1932, Amsterdam, Holland; d. 21 September 1942, Auschwitz concentration camp, Poland - Holocaust victim. 4. ESTHER DE WOLF, b. 01 June 1935, Amsterdam, Holland; d. 21 September 1942, Auschwitz concentration camp, Poland - Holocaust victim. 5. MANUEL DE WOLF, b. 24 April 1937, Amsterdam, Holland; d. 21 September 1942, Auschwitz concentration camp, Poland - Holocaust victim. LEVIE LEUW was born 09 August 1914 in Amsterdam, Holland, and died 30 September 1942 in Auschwitz concentration camp, Poland - Holocaust victim. He married HELENA VAN STRATEN 22 September 1938 in Amsterdam, Holland, daughter of EMANUEL VAN STRATEN and REINTJE DUVEEN. She was born 24 March 1914 in Amsterdam, Holland, and died 26 July 1942 in Auschwitz concentration camp, Poland - Holocaust victim. Resided with family, February 1941: Hoendiepstraat 5 I, Amsterdam, Holland. 1. SALOMON LEUW, b. 03 November 1940, Amsterdam, Holland; d. 26 July 1942, Auschwitz concentration camp, Poland - Holocaust victim. SALOMON DE WOLF was born 14 February 1841 in Amsterdam, Holland, and died 04 December 1915 in Amsterdam, Holland. He married MARGARETHA VAN GELDER 10 May 1865 in Amsterdam, Holland. She was born 04 September 1843 in Amsterdam, Holland, and died 20 February 1929 in Amsterdam, Holland. How are you related to Salomon de Wolf? 1. ESTER DE WOLF, b. 15 September 1866, Amsterdam, Holland; d. 24 October 1942, Municipality unknown - Holocaust victim. 2. FEMMETJE DE WOLF, b. 27 May 1869. 3. DIENTJE DE WOLF, b. 05 May 1870, Amsterdam, Holland; d. 26 March 1943, Sobibor death camp, Poland - Holocaust victim; m. MEIJER (MEYER) MOT, 08 June 1895, Zaandam, Holland; b. 11 April 1866, Amsterdam, Holland; d. 26 March 1943, Sobibor death camp, Poland - Holocaust victim. Resided with wife, February 1941: Nieuwe Amstelstraat 15 I, Amsterdam, Holland. 4. SAMUEL DE WOLF, m. JANTJE BRAAKMAN, 17 August 1904, Amsterdam, Holland. 5. SARA DE WOLF, b. 21 November 1875, Amsterdam, Holland; d. 10 September 1942, Auschwitz concentration camp, Poland - Holocaust victim. 6. RUBEN DE WOLF, m. SARA ENSEL, 15 July 1896, Amsterdam, Holland; b. 23 June 1873, Amsterdam, Holland. 7. MOZES DE WOLF, b. 27 August 1877, Amsterdam, Holland; d. 26 March 1943, Sobibor death camp, Poland - Holocaust victim. 8. BERNARD DE WOLF, b. 27 October 1880, Amsterdam, Holland; d. 19 October 1942, Auschwitz concentration camp, Poland - Holocaust victim. 9. ELISABETH DE WOLF, b. 21 March 1889, Amsterdam, Holland; d. 12 October 1942, Auschwitz concentration camp, Poland - Holocaust victim. ESTER DE WOLF was born 15 September 1866 in Amsterdam, Holland, and died 24 October 1942 in Municipality unknown - Holocaust victim. She married EMANUEL VAN VEEN 28 March 1894 in Weesp, Holland, son of LEVIE VAN VEEN and NAATJE VISJAGER. 1. MARGARETHA VAN VEEN, b. 28 August 1896, Amsterdam, Holland; d. 09 March 1974, Antwerp, Belgium. 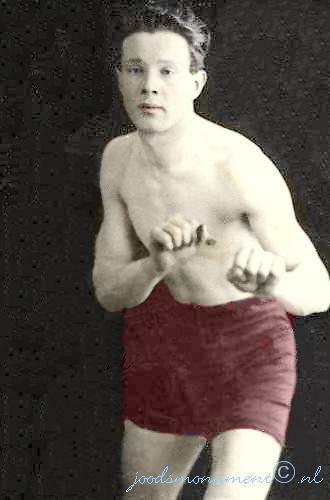 FEMMETJE DE WOLF was born 27 May 1869. 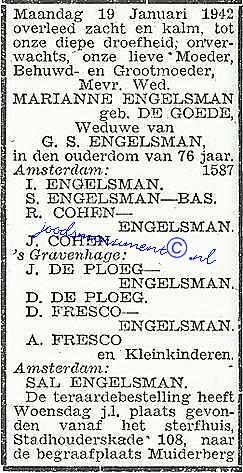 She married MOZES COHENNO 21 August 1894 in Zaandam, Holland, son of GABRIEL COHENNO and ESTHER VAN GELDER. He was born 25 January 1863 in Amsterdam, Holland, and died 28 October 1942 in Amsterdam, Holland. Resided, February 1941: Tweede Jan Steenstraat 54 huis, Amsterdam, Holland. 1. MARGARETHA COHENNO, b. 04 January 1897, Amsterdam, Holland; d. 17 September 1942, Auschwitz concentration camp, Poland - Holocaust victim. 2. 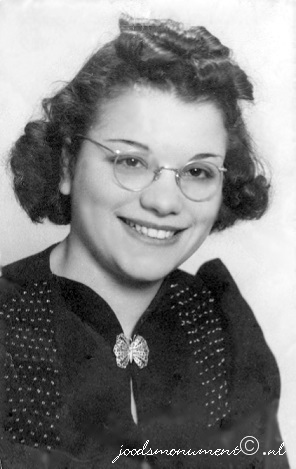 ESTHER COHENNO, b. 06 January 1896, Amsterdam, Holland; d. 08 October 1942, Auschwitz concentration camp, Poland - Holocaust victim. SARA DE WOLF was born 21 November 1875 in Amsterdam, Holland, and died 10 September 1942 in Auschwitz concentration camp, Poland - Holocaust victim. She married JOSEPH DE WOLFF 24 November 1909 in Amsterdam, Holland, son of MOSES DE WOLFF and HANNAH VAN GELDER. Resided: Joh. Geradtsweg 81, Hilversum, Holland. 1. MARGUERITE DE WOOLF, b. 20 December 1912, Southend on Sea, Essex, England; d. 16 November 2006, Wellington Public Hospital, Wellington, New Zealand; m. LEO LEVY. MOZES DE WOLF was born 27 August 1877 in Amsterdam, Holland, and died 26 March 1943 in Sobibor death camp, Poland - Holocaust victim. He married VROUWTJE ROODFELD 21 February 1900 in Amsterdam, Holland. She was born 19 September 1879 in Amsterdam, Holland, and died 26 March 1943 in Sobibor death camp, Poland - Holocaust victim. Resided with wife, February 1941: Vrolikstraat 249, Amsterdam, Holland. Before the war Moses de Wolf lived at Vrolikstraat 249 in the Transvaal neighbourhood among the poorer Jewish community of Amsterdam. He prior moved from the neighbourhood around Waterloo after many homes located in the area were declared uninhabitable. The neighbourhood just north of the Transvaal area, the Oosterparkbuurt, attracted many Jewish occupants. This neighbourhood was close to the new synagogue on the Linnaeusstraat, while in the thirties for a large portion of the residents, socialism was more important than religion. The joodsmonument.nl site shows that in the Vrolikstraat several hundred Jewish residents did not survive the war. The history of these people was totally obliterated during the Holocaust. In 2010 their former homes were demolished, despite strong protests from the residents of this neighbourhood. The same happened to the 3rd Oosterparkstraat 44-66. Today (2015) virtually nothing is left of the original Jewish quarter of old Amsterdam. 1. SALOMON DE WOLF, b. 17 June 1900, Amsterdam, Holland; d. 31 October 1942, Central Europe, Municipality unknown - Holocaust victim. 2. LiPMAN DE WOLF, b. 23 November 1902, Amsterdam, Holland; d. 25 September 1965, Amstelveen, Amsterdam, Holland; m. GEERTRUIDA VERHOEFF, 15 October 1925, Amsterdam, Holland; b. 10 August 1904, Weesp, Holland; d. 23 March 1988, Amstelveen, Amsterdam, Holland. BERNARD DE WOLF was born 27 October 1880 in Amsterdam, Holland, and died 19 October 1942 in Auschwitz concentration camp, Poland - Holocaust victim. He married (1) ESTHER BLITZ 02 December 1903 in Weesp, Holland, daughter of SIMON BLITZ and ELISABETH VEERMAN. She was born 09 December 1875 in Amsterdam, Holland. He married (2) NAATJE BLITZ 16 September 1908 in Amsterdam, Holland, daughter of SIMON BLITZ and ELISABETH VEERMAN. She was born 30 May 1877 in Amsterdam, Holland, and died 19 October 1942 in Auschwitz concentration camp, Poland - Holocaust victim. 1. SALOMON DE WOLF, b. 23 July 1909, Amsterdam, Holland; d. 23 January 1945; m. EMILIE RESCH, 16 August 1933, Rotterdam, Holland; b. Obersulz, Gänserndorf District, Austria. ELISABETH DE WOLF was born 21 March 1889 in Amsterdam, Holland, and died 12 October 1942 in Auschwitz concentration camp, Poland - Holocaust victim. She married EDUARD DE LANGE 20 June 1929 in Amsterdam, Holland, son of JOZEF DE LANGE and EVA DENNEBOOM. He was born 31 October 1887 in Deventer, Salland, Overijssel, Holland, and died 12 October 1942 in Auschwitz concentration camp, Poland - Holocaust victim. Resided with family, May 1940: Nieuwstraat 34, Arnhem, Holland. 1. EVALINA MARGARETHA DE LANGE, b. 01 July 1930, Arnhem, Gelderland, Holland; d. 12 October 1942, Auschwitz concentration camp, Poland - Holocaust victim. MARGARETHA VAN VEEN was born 28 August 1896 in Amsterdam, Holland, and died 09 March 1974 in Antwerp, Belgium. She married JOSEPH KOEKOEK 10 October 1917 in Zaandam, Holland, son of CALMAN KOEKOEK and RACHEL POLAK. He was born 15 February 1895 in Amsterdam, Holland. Parents of Joseph Koekoek were CALMAN KOEKOEK born 31 July 1867 in Rotterdam, Holland, and died September 1942 in Auschwitz concentration camp, Poland - Holocaust victim. He married RACHEL POLAK 09 June 1892 in Amsterdam, Holland. She was born 11 August 1859 in Amsterdam, Holland, and died 22 December 1918 in Antwerp, Belgium. 1. RACHEL KOEKOEK, b. 20 August 1918, Amsterdam, Holland; m. MAURITS ZILVERBERG; b. 30 October 1912, Oss, North Brabant, Holland. ESTHER COHENNO was born 06 January 1896 in Amsterdam, Holland, and died 08 October 1942 in Auschwitz concentration camp, Poland - Holocaust victim. She married ISIDOR ROOZENDAAL 28 July 1920 in Zaandam, Holland, son of SALOMON ROOZENDAAL and ROSETTA TROMPETTER. He was born 04 February 1890 in Almelo, Overijssel, Holland, and died 12 October 1942 in Blechhammer: Sub-camp of Auschwitz III - Monowitz, Poland - Holocaust victim. Resided with family, February 1941: Miquelstraat 34 III, Amsterdam, Holland. 15 December 1926 in Amsterdam, Holland. She was born 07 February 1871 in Enschede, Twents, Overijssel, Holland, and died 30 April 1943 in Sobibor death camp, Poland - Holocaust victim. Salomon Roozendaal was the son of Izaak Salomon Roozendaal and Betje Kan. He was first married to Rosetta Trompetter. After she had died in 1926 he married Frederika Cohen. She was a pre-marital child of Mina Cohen. Later her half sister Rosa Mooij was born. Salomon Roozendaal and Rosetta Trompetter had six children, among whom: Elisabeth (who died at a young age), Marie, Isidor, Siegfried, Jozeph and another Elisabeth (who died at a young age). Resided with husband and son, 1 February, 1941: Quellijnstraat 106 huis, Amsterdam, Holland. Belonging to: Isidor Roozendaal and his family, Amsterdam. Nazi bank, established to register and loot Jewish property. The name had belonged to a established Jewish bank in Amsterdam. The new bank with the same name, located on the Sarphatistraat, was set up to register systematically and subsequently loot money, securities and valuables from Jews. The name of this Nazi bank is often shortened to Liro bank. 1. MAX ROOZENDAAL, b. 11 November 1921, Amsterdam, Holland; d. 17 August 1942, Auschwitz concentration camp, Poland - Holocaust victim. 2. FRIEDA ROOZENDAAL, b. 13 October 1927, Amsterdam, Holland; d. 08 October 1942, Auschwitz concentration camp, Poland - Holocaust victim. 3. FREDDY ROOZENDAAL, b. 07 April 1933, Amsterdam, Holland; d. 08 October 1942, Auschwitz concentration camp, Poland - Holocaust victim. SALOMON DE WOLF was born 17 June 1900 in Amsterdam, Holland, and died 31 October 1942 in Central Europe, Municipality unknown - Holocaust victim. He married ESTHER BARBER 15 December 1920 in Amsterdam, Holland, daughter of CALMAN BARBER and HEINTJE WURMS. She was born 23 October 1895 in Amsterdam, Holland, and died 17 September 1942 in Auschwitz concentration camp, Poland - Holocaust victim. Parents of Esther Barber were CALMAN BARBER born 31 December 1870 in Den Helder, Holland, and died 20 March 1943 in Sobibor death camp, Poland - Holocaust victim and HEINTJE WURMS. He married (1) HEINTJE WURMS 29 June 1892 in Amsterdam, Holland, daughter of ABRAHAM WURMS and ESTHER RITMEESTER. She was born 29 May 1870 in Amsterdam, Holland, and died 01 September 1897 in Amsterdam, Holland. He married (2) SIENTJE VAN WEST 11 January 1899 in Amsterdam, Holland, daughter of MANUEL VAN WEST and KLARA WURMS. She was born 20 June 1873 in Amsterdam, Holland, and died 20 March 1943 in Sobibor death camp, Poland - Holocaust victim. Resided with wife, Sientje van West, February 1941: Saffierstraat 42 I, Amsterdam, Holland. 1. MOZES DE WOLF, b. 23 November 1920, Amsterdam, Holland; d. 31 October 1942, Central Europe, Municipality unknown - Holocaust victim. 2. HENDRIKA DE WOLF, b. 26 July 1926, Amsterdam, Holland; d. 17 September 1942, Auschwitz concentration camp, Poland - Holocaust victim. EMANUEL (EMILE) KOEKOEK. He married MARIETTE VAN DE REET. 1. MARION MARGUERITE KOEKOEK She married (1) HAROLD SCOTT BELORE. She married (2) JORGE JOSE BETTER GRUNBAUM. 1. NAOMI RAQUEL BETTER, b. Quito, Ecuador. 2. SAUL ADRIAN BETTER, b. Quito, Ecuador. ARON FRESCO was born 17 December 1809 in The Hague, Holland, and died 26 October 1870 in The Hague, Holland. He married JETJE BOBBE 22 March 1837 in The Hague, Holland, daughter of HARTOG BOBBE and BRANCA LEVY. She was born 23 September 1814 in The Hague, Holland, and died 28 October 1864 in The Hague, Holland. How are you related to Aron Fresco? 1. JACOB FRESCO, b. 28 October 1838, The Hague, Holland; d. 01 March 1839, The Hague, Holland. 2. SIMON FRESCO, b. 31 December 1839, The Hague, Holland; d. 15 February 1880, The Hague, Holland. 3. LEENTJE FRESCO, b. 12 January 1842, The Hague, Holland; d. 11 March 1842, The Hague, Holland. 4. EVA FRESCO, b. 04 October 1843, The Hague, Holland; d. 21 January 1889, Amsterdam, Holland. 5. HARTOG FRESCO, b. 21 November 1846, The Hague, Holland; d. 14 November 1920, The Hague, Holland. 6. JACOB FRESCO, b. 30 October 1848, The Hague, Holland; d. 14 November 1849, The Hague, Holland. 7. BETJE BRANCA FRESCO, b. 15 January 1851, The Hague, Holland; d. 31 January 1940, The Hague, Holland. 8. ELIAZAR FRESCO, b. 27 February 1853, The Hague, Holland; d. 26 May 1916, The Hague, Holland. 9. DAVID FRESCO, b. 26 April 1855, The Hague, Holland; d. 20 October 1856, The Hague, Holland. 10. SIENTJE FRESCO, b. 23 August 1857, The Hague, Holland; d. 23 March 1919, The Hague, Holland. SIMON FRESCO was born 31 December 1839 in The Hague, Holland, and died 15 February 1880 in The Hague, Holland. He married ELISABETH JACOBSON 04 December 1861 in The Hague, Holland, daughter of ASSER JACOBSON and MIETJE WINKEL. She was born 23 March 1840 in Den Bosch, Hertogenbosch, Holland, and died 18 July 1931 in The Hague, Holland. 1. AARON FRESCO, b. 04 January 1862, The Hague, Holland; d. 09 April 1943, Sobibor death camp, Poland - Holocaust victim. 2. DAVID FRESCO, b. 10 January 1864, The Hague, Holland; d. 29 January 1864, The Hague, Holland. 3. JACOB FRESCO, b. 16 December 1864, The Hague, Holland; d. 03 February 1868, The Hague, Holland. 4. JETJE FRESCO, b. 25 September 1867, The Hague, Holland; d. 14 May 1943, Sobibor death camp, Poland - Holocaust victim; m. MOSES FRESCO, 07 November 1894, The Hague, Holland; b. 14 December 1865, The Hague, Holland; d. 16 July 1938, The Hague, Holland. Resided: Van Limburg Stirumstraat 169, Den Haag, Holland. 5. ASSER FRESCO, b. 04 April 1869, The Hague, Holland; d. 24 December 1871, The Hague, Holland. 6. ELIAZAR FRESCO, b. 04 December 1869, The Hague, Holland; d. 09 January 1918, The Hague, Holland. 7. MIETJE FRESCO, b. 28 October 1872, The Hague, Holland; d. 14 May 1943, Sobibor death camp, Poland - Holocaust victim. 8. JACOB FRESCO, b. 07 June 1874, The Hague, Holland; d. 21 January 1943, Auschwitz concentration camp, Poland - Holocaust victim. 9. LEON FRESCO, b. 21 February 1876, The Hague, Holland; d. 10 October 1942, Auschwitz concentration camp, Poland - Holocaust victim. 10. HARTOG FRESCO, b. 05 February 1878, The Hague, Holland; d. 25 January 1975, The Hague, Holland; m. MARIA BERNARDINA SCHUURMANS; b. 26 February 1885, The Hague, Holland. EVA FRESCO was born 04 October 1843 in The Hague, Holland, and died 21 January 1889 in Amsterdam, Holland. She married JACOB HARINGMAN 30 June 1886 in Amsterdam, Holland, son of MARCUS HARINGMAN and VROUWTJE FRANK. He was born 07 March 1844 in Amsterdam, Holland, and died 29 November 1925 in Amsterdam, Holland. 1. ABRAHAM HARINGMAN, b. 19 May 1887, Amsterdam, Holland; d. 18 October 1934, Amsterdam, Holland. ELIAZAR FRESCO was born 27 February 1853 in The Hague, Holland, and died 26 May 1916 in The Hague, Holland. He married SARA VAN DER KLOOT 25 October 1876 in The Hague, Holland, daughter of ELIAZAR KLOOT and LENA FRANSMAN. She was born 11 May 1855 in The Hague, Holland, and died 24 November 1913 in The Hague, Holland. 1. SOPHIA FRESCO, b. 07 November 1872, The Hague, Holland; d. 28 May 1943, Sobibor death camp, Poland - Holocaust victim. 2, AARON FRESCO, b. 29 July 1877, The Hague, Holland; d. 12 August 1878, The Hague, Holland. 3. LEVIE FRESCO, b. 27 February 1879, The Hague, Holland; d. 19 November 1942, Auschwitz concentration camp, Poland - Holocaust victim. 4. SIMON FRESCO, b. 12 February 1881, The Hague, Holland; d. 03 September 1942, Auschwitz concentration camp, Poland - Holocaust victim. 5. 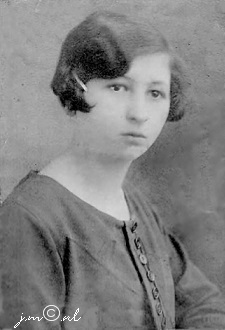 LENA FRESCO, b. 30 March 1883, The Hague, Holland; d. 26 February 1943, Auschwitz concentration camp, Poland - Holocaust victim. 6. ABRAHAM FRESCO, b. 16 May 1887, The Hague, Holland; d. 12 October 1942, Auschwitz concentration camp, Poland - Holocaust victim. 7. HENRIETTE FRESCO, b. 19 May 1889, The Hague, Holland; d. 25 April 1921, The Hague, Holland. 8. EVA FRESCO, b. 21 March 1891, The Hague, Holland; d. 08 October 1942, Auschwitz concentration camp, Poland - Holocaust victim. 9. MARIANNE FRESCO, b. 09 January 1896, The Hague, Holland; d. 30 September 1942, Auschwitz concentration camp, Poland - Holocaust victim. 10. HARTOG FRESCO, b. 11 June 1897, The Hague, Holland; d. 28 October 1915, The Hague, Holland. 11. SALOMON FRESCO, b. 17 December 1899, The Hague, Holland; d. 07 April 1900, The Hague, Holland. SIENTJE FRESCO was born 23 August 1857 in The Hague, Holland, and died 23 March 1919 in The Hague, Holland. She married SALOMON VAN LEEUWEN 30 November 1887 in The Hague, Holland, son of MOSES VAN LEEUWEN and GRIETJE SNOEK. He was born 04 October 1858 in The Hague, Holland, and died 20 March 1938 in The Hague, Holland. 1. KAATJE VAN LEEUWEN, b. 29 November 1888, The Hague, Holland; d. 16 April 1943, Sobibor death camp, Poland - Holocaust victim. 2. ARON VAN LEEUWEN, b. 19 December 1889, The Hague, Holland; d. 28 September 1935, The Hague, Holland. 3. MOZES VAN LEEUWEN was born 05 August 1891 in The Hague, Holland, and died 14 October 1936 in The Hague, Holland. He married REBEKKA DANSER 13 September 1916 in The Hague, Holland, daughter of ABRAHAM DANSER and SOPHIA LOGCHER. She was born 16 October 1898 in The Hague, Holland, and died 01 February 1943 in Auschwitz concentration camp, Poland - Holocaust victim. Parents of Rebekka Danser were ABRAHAM DANSER born 03 January 1868 in The Hague, Holland, and died 04 August 1929 in The Hague, Holland. He married SOPHIA LOGCHER 09 November 1892 in The Hague, Holland. She was born 26 January 1872 in The Hague, Holland, and died 15 December 1942 in Auschwitz concentration camp, Poland - Holocaust victim. Resided with relatives, April 1942: Gedempte Gracht 225, Den Haag, Holland. AARON FRESCO was born 04 January 1862 in The Hague, Holland, and died 09 April 1943 in Sobibor death camp, Poland - Holocaust victim. He married SAARTJE COSMAN 01 September 1886 in The Hague, Holland, daughter of ALEXANDER COSMAN and MARIA VAN LEEUWEN. She was born 13 April 1860 in The Hague, Holland, and died 06 April 1942 in The Hague, Holland. Resided, April 1942: Van Ravesteinstraat 75 r, Den Haag, Holland. 1. MIETJE FRESCO, b. 31 January 1887, The Hague, Holland; d. 09 April 1943, Sobibor death camp, Poland - Holocaust victim. 2. SIMON FRESCO, b. 25 May 1890, The Hague, Holland; d. September 1944, Blechhammer: Sub-camp of Auschwitz III - Monowitz, Poland - Holocaust victim. 3. ELISABETH FRESCO, b. 25 February 1888, The Hague, Holland; d. 25 January 1889, The Hague, Holland. ELIAZAR FRESCO was born 04 December 1869 in The Hague, Holland, and died 09 January 1918 in The Hague, Holland. He married AALTJE HAAGMAN 23 August 1893 in The Hague, Holland, daughter of GERRIT HAAGMAN and RACHEL LA FUENTE. She was born 25 August 1865 in The Hague, Holland, and died 12 September 1927 in The Hague, Holland. 1. RACHEL FRESCO, b. 11 August 1894, The Hague, Holland; d. 27 October 1936, The Hague, Holland. MIETJE FRESCO was born 28 October 1872 in The Hague, Holland, and died 14 May 1943 in Sobibor death camp, Poland - Holocaust victim. She married MOSES HAKKER 13 February 1901 in The Hague, Holland, son of BAREND HAKKER and BETJE KEIJL. He was born 30 August 1876 in The Hague, Holland, and died 05 October 1941 in The Hague, Holland. Resided, April 1942: Spui 164 a, Den Haag, Holland. 1. SIMON HAKKER, b. 11 May 1901, The Hague, Holland; d. 28 May 1943, Auschwitz concentration camp, Poland - Holocaust victim. 2. BAREND HAKKER, b. 30 August 1902, The Hague, Holland; d. 21 May 1943, Sobibor death camp, Poland - Holocaust victim. 3. ELISABETH HAKKER, b. 09 August 1904, The Hague, Holland; d. 08 September 1904, The Hague, Holland. 4. JACOB HAKKER, b. 11 July 1906, The Hague, Holland; d. 30 September 1942, Auschwitz concentration camp, Poland - Holocaust victim. Occupation: Travelling salesman for textiles. 5. BETJE HAKKER, b. 03 May 1911, The Hague, Holland; d. 16 April 1996, Weesp, Holland. JACOB FRESCO was born 07 June 1874 in The Hague, Holland, and died 21 January 1943 in Auschwitz concentration camp, Poland - Holocaust victim. He married DEBORA COHEN 03 August 1904 in The Hague, Holland, daughter of JACOB COHEN and HANNA VAZ. She was born 18 August 1871 in Amsterdam, Holland, and died 21 January 1943 in Auschwitz concentration camp, Poland - Holocaust victim. Resided with family, April 1942: Rijswijkscheplein 5, Den Haag, Holland. Belonging to: Jacob Fresco and his family, Den Haag. 1. HANNA FRESCO, b. 16 March 1906, The Hague, Holland; d. 19 October 1942, Auschwitz concentration camp, Poland - Holocaust victim. 2. ELISABETH FRESCO, b. 13 May 1908, The Hague, Holland; d. 30 September 1942, Auschwitz concentration camp, Poland - Holocaust victim. 3. JACQUES FRESCO was born 10 August 1913 in The Hague, Holland, and died 10 May 1940 in The Hague, Holland. He married WILHELMINA MARIA JACOBA HENRIETTE BOXMEER 04 August 1937 in Rijswijk, Holland, daughter of JACOBUS BOXMEER and MARIA GROENENSTIJN. She was born 21 November 1901 in The Hague, Holland, and died 04 September 1989 in Rijswijk, Holland. LEON FRESCO was born 21 February 1876 in The Hague, Holland, and died 10 October 1942 in Auschwitz concentration camp, Poland - Holocaust victim. He married MARGARETHA BLITZ 14 August 1901 in The Hague, Holland, daughter of ABRAHAM BLITZ and BENVENIDA COELHO. She was born 20 July 1877 in The Hague, Holland, and died 19 November 1942 in Auschwitz concentration camp, Poland - Holocaust victim. Resided with family, April 1942: Bezuidenhoutscheweg 263, Den Haag, Holland. Belonging to: Leon Fresco and his family, Den Haag. Front room: carpet, foot mat, lace curtain and drapes (4), oil painting (3), wall plate (4), antique chandelier, clock, table lamp, flower vase (4), standing table lamp, stone figure, fireplace with plate, tea cupboard, flower table (3), table with cloth, chair (4), armchair (2), divan with cover, piano, piano stool, wall cupboard. Back room: carpet, oot mat,hanging lamp, wall plate, mirror, flower vase (6), lace curtain and drapes (2), table with cloth, armchair, solid fuel oven with plate, bedside table, chest of drawers, tea cupboard, wardrobe with mirror, table lamp. Side-room: floorcloth, carpet, lace curtains (10), curtains (2), table (2), tea cupboard, wall plate (3), hanging lamp, gas ring, kitchenware. Corridor: coat hooks, wall carpet, wall clock, foot mat, wall plate, wall cupboard. Attic: table (5), chair (5), armchair (5), sideboard, vacuum cleaner, flower table, vase (3), balloon shade for electric light (3), kitchen step, worthless items, iron bedstead, vacuum cleaner. Corridor: linoleum, coat hooks hallway light. Back room: matting, bedstead, linen cupboard, dressing table, round table, kitchen table, wall plate. 1. SIMON FRESCO, b. 30 June 1902, The Hague, Holland; d. 10 October 1942, Auschwitz concentration camp, Poland - Holocaust victim. 2. ABRAHAM FRESCO, b. 20 June 1903, The Hague, Holland; d. 19 November 1942, Auschwitz concentration camp, Poland - Holocaust victim. 3. ANNA BENVENIDA FRESCO, b. 20 May 1910, The Hague, Holland; d. 03 September 1942, Auschwitz concentration camp, Poland - Holocaust victim. ABRAHAM HARINGMAN was born 19 May 1887 in Amsterdam, Holland, and died 18 October 1934 in Amsterdam, Holland. He married AALTJE BREMER 12 November 1913 in Amsterdam, Holland, daughter of ELIAS BREMER and VOGELTJE KUIT. She was born 02 August 1887 in Amsterdam, Holland, and died 17 September 1942 in Auschwitz concentration camp, Poland - Holocaust victim. Resided with family, February 1941: Makassarstraat 158 huis, Amsterdam, Holland. According to a list with shops of Jewish owners, compiled by the Amsterdam police in 1940, this family had a cigar shop, address: Makassarstraat 106 in Amsterdam. 1. JACOB HARINGMAN was born 20 June 1915 in Amsterdam, Holland, and died 30 September 1942 in Auschwitz concentration camp, Poland - Holocaust victim. 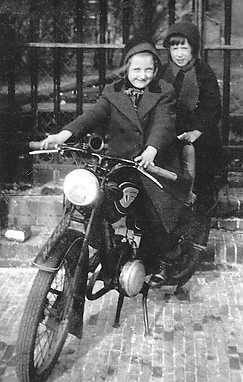 He married ELISABETH COHEN 18 April 1940 in Amsterdam, Holland, daughter of MANUS COHEN and JANSJE ALLEGRO. She was born 03 August 1913 in Amsterdam, Holland, and died 19 January 1945 in Auschwitz concentration camp, Poland - Holocaust victim. Parents of Elisabeth Cohen were MANUS COHEN born 11 May 1887 in Amsterdam, Holland, and died 22 May 1944 in Auschwitz concentration camp, Poland - Holocaust victim. He married JANSJE ALLEGRO 30 August 1911 in Amsterdam, Holland. She was born 26 February 1892 in Amsterdam, Holland, and died 22 May 1944 in Auschwitz concentration camp, Poland - Holocaust victim. Resided with family, February 1941:Waterlooplein 51 I, Amsterdam, Holland. Resided with wife, February 1941:Hunzestraat 65 II, Amsterdam, Holland. 2. ELIAS HARINGMAN, b. 23 April 1917, Amsterdam, Holland; d. 30 September 1942, Auschwitz concentration camp, Poland - Holocaust victim. SOPHIA FRESCO was born 07 November 1872 in The Hague, Holland, and died 28 May 1943 in Sobibor death camp, Poland - Holocaust victim. She married PHILIP PRINS 07 September 1892 in The Hague, Holland, son of MEIJER PRINS and MATJE VAN LEEUWEN. He was born 05 January 1871 in The Hague, Holland, and died 05 March 1943 in Westerbork transit camp, Drenthe, Holland – Holocaust victim. Philip Prins and Sophia Fresco had 11 children: Jacques, Emanuel, Louis, Jacob, Barend, Simon, Martha, Abraham, Lena and two children who presumably survived the war. Philip Prins died on 5 March 1943 at the age of 72 in the Westerbork camp. He was buried in the Jewish cemetery in Assen on 8 March 1943. The funeral records at the Jewish cemetery in Assen reveal that Philip Prins was buried there. 1. MEIJER PRINS, b. 02 December 1892, The Hague, Holland; d. 07 May 1943, Sobibor death camp, Poland - Holocaust victim. 2. SAARTJE PRINS, b. 04 May 1894, The Hague, Holland; d. 22 October 1942, Auschwitz concentration camp, Poland - Holocaust victim. 3. JACQUES PRINS was born 07 February 1896 in The Hague, Holland, and died 31 December 1942 in Auschwitz concentration camp, Poland - Holocaust victim. He married REBEKKA FRESCO 18 September 1929 in The Hague, Holland, daughter of JOEL FRESCO and LENA NORDEN. She was born 26 October 1890 in The Hague, Holland, and died 23 August 1942 in The Hague, Holland. Resided with family, April 1942: Oranjelaan 24, Den Haag, Holland. 4. EMANUEL PRINS, b. 31 March 1898, The Hague, Holland; d. 31 March 1944, Auschwitz concentration camp, Poland - Holocaust victim. 5. LOUIS PRINS, b. 07 February 1900, The Hague, Holland; d. 21 May 1943, Sobibor death camp, Poland - Holocaust victim. 6. JACOB PRINS, b. 12 January 1902, The Hague, Holland; d. 23 July 1943, Sobibor death camp, Poland - Holocaust victim. 7. HERMAN PRINS, b. 05 January 1904, The Hague, Holland; m. SELINA VAN KOLM; b. 31 March 1914, Amsterdam, Holland. 8. BAREND PRINS, b. 03 January 1906, The Hague, Holland; d. 21 May 1943, Sobibor death camp, Poland - Holocaust victim. 9. SIMON PRINS, b. 02 May 1908, The Hague, Holland; d. 31 March 1944, Central Europe, Municipality unknown - Holocaust victim. Resided: Hofwijckplein 34, Den Haag, Holland. Simon Prins, a cafe owner, and Mietje van Coevorden had given notice of their intended marriage. The wedding could not take place, because one of them was deported before the wedding date. 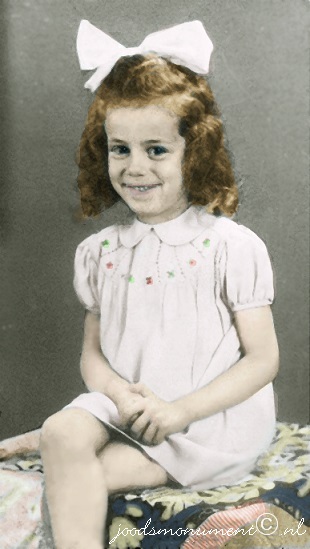 10 MARTHA PRINS was born 23 September 1910 in The Hague, Holland, and died 01 October 1942 in Auschwitz concentration camp, Poland - Holocaust victim. She married LOUIS SWETSCHINKI 15 March 1942 in The Hague, Holland, son of GIERSCHKO SWETSCHINSKI and GALIA SOSSENKA. He was born 13 March 1911 in Rotterdam, Holland, and died 31 October 1943 in Auschwitz concentration camp, Poland - Holocaust victim. Resided with wife, April 1942: Weteringkade 109, Den Haag, Holland. Parents of Louis Swetgierschko were GIERSCHKO SWETSCHINSKI born 06 April 1872 in Aleksandrow, Kuyavian-Pomeranian Voivodesh, Poland and died 09 April 1943 in Sobibor death camp, Poland - Holocaust victim. He married GALIA SOSSENKA. She was born 02 March 1915 in Rotterdam, Holland, and died 31 January 1944 in Auschwitz concentration camp, Poland - Holocaust victim. Resided with family, April 1942: Eerste van den Boschstraat 210, Den Haag, Holland. Gierschko Swetschinski and Galia Sossenka had at least three children: Maria, Serlina and one child that survived the war. 11. ABRAHAM PRINS, b. 12 December 1912, The Hague, Holland; d. 14 May 1943, Sobibor death camp, Poland - Holocaust victim. Resided: Eschdoornstraat 114, Den Haag, Holland. 12. LENA PRINS was born 11 December 1914 in The Hague, Holland, and died 16 July 1943 in Sobibor death camp, Poland - Holocaust victim. She married MARCUS PAIS, son of ELIAS PAIS and HEINTJE TURFRIJER. He was born 08 June 1918 in The Hague, Holland, and died 16 July 1943 in Sobibor death camp, Poland - Holocaust victim. Parents of Marcus Pais were ELIAS PAIS born 29 November 1894 in Amsterdam, Holland, and died 31 March 1944 in Central Europe, Municipality unknown - Holocaust victim. He married HEINTJE TURFRIJER 28 October 1914 in The Hague, Holland, daughter of JOSEPH TURFRIJER and CAROLINA BOLLEGRAAF. She was born 05 June 1893 in The Hague, Holland, and died 02 November 1942 in Auschwitz concentration camp, Poland - Holocaust victim. LEVIE FRESCO was born 27 February 1879 in The Hague, Holland, and died 19 November 1942 in Auschwitz concentration camp, Poland - Holocaust victim. He married CATHARINA WOLFF 15 August 1906 in The Hague, Holland, daughter of BENJAMIN WOLFF and LEENTJE WIJNBERG. She was born 28 December 1881 in The Hague, Holland, and died 19 November 1942 in Auschwitz concentration camp, Poland - Holocaust victim. Resided with wife, April 1942: Groenewegje 138, Den Haag, Holland. 1. BENJAMIN FRESCO was born 03 June 1907 in The Hague, Holland, and died 13 July 1939 in The Hague, Holland. SIMON FRESCO was born 12 February 1881 in The Hague, Holland, and died 03 September 1942 in Auschwitz concentration camp, Poland - Holocaust victim. He married CHRISTINA HELENA KROS 04 January 1922 in The Hague, Holland, daughter of PIETER KROS and HELENA HAGEDOORN. She was born 20 September 1875 in The Hague, Holland, and died 30 March 1945 in The Hague, Holland. Resided: Straatnaam niet bekend, Den Haag, Holland. 1. EMANUEL FRESCO, b. 31 March 1908, The Hague, Holland; d. 28 July 1981, The Hague, Holland. LENA FRESCO was born 30 March 1883 in The Hague, Holland, and died 26 February 1943 in Auschwitz concentration camp, Poland - Holocaust victim. She married EMANUEL POONS 16 December 1914 in The Hague, Holland, son of MOZES POONS and BETJE VAN RIJS. He was born 28 December 1884 in The Hague, Holland, and died 26 February 1943 in Auschwitz concentration camp, Poland - Holocaust victim. 1. BETJE POONS was born 02 November 1915 in The Hague, Holland, and died 20 May 1943 in Sobibor death camp, Poland - Holocaust victim. She married EMANUEL BLOK 29 July 1942 in The Hague, Holland, son of DAVID BLOK and NAATJE LENS. He was born 04 March 1909 in The Hague, Holland, and died 28 May 1943 in Sobibor death camp, Poland - Holocaust victim. Parents of Emanuel Blok were DAVID BLOK born 14 May 1879 in The Hague, Holland, and died 09 April 1943 in Sobibor death camp, Poland - Holocaust victim. He married NAATJE LENS 03 August 1904 in The Hague, Holland. She was born 24 July 1882 in The Hague, Holland, and died 09 April 1943 in Sobibor death camp, Poland - Holocaust victim. 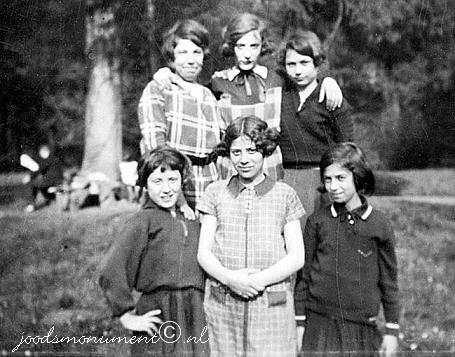 Resided with family, April 1942: Huijgenspark 35, Den Haag, Holland. Belonging to: David Blok and his family, Den Haag. gas ring, solid fuel oven, table (2), rack with saucepans, wall cupboard, water kettle, kitchenware. Corridor: floor cloth, runner, stair carpet, hanging wall mirror(2), coat hooks with clothing. Wedding on 29 July 1942 in Den Haag with the bridal couple and their mutual parents. From left to right: Emanuel Poons, Lena Poons-Fresco, the groom Emanuel (Max) Blok and his bride Betje (Beppie) Poons, Naatje Blok-Lens and David Blok. 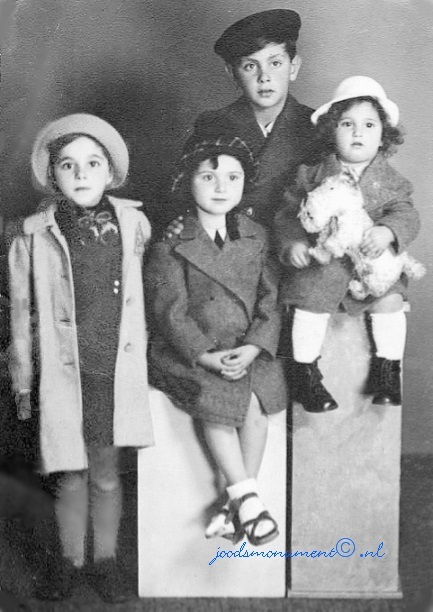 From periods of 7 months up to 14 months after this photograph was taken, all the Poons, Blok and Fresco members of this family were deported and murdered at either Sobibor or Auschwitz concentration camps. None survived the war. 2. HERMAN POONS was born 04 November 1917 in The Hague, Holland, and died 30 September 1942 in Auschwitz concentration camp, Poland - Holocaust victim. He married MIETJE HAMME 20 August 1942 in Westerbork transit camp, Drenthe, Holland, daughter of LEVIE HAMME and MARIANNE LENS. She was born 04 January 1922 in The Hague, Holland, and died 30 September 1942 in Auschwitz concentration camp, Poland - Holocaust victim. Parents of Mietje were LEVIE HAMME born 21 December 1892 in The Hague, Holland, and died 30 September 1942 in Auschwitz concentration camp, Poland - Holocaust victim. He married MARIANNE LENS 14 April 1915 in The Hague, Holland. She was born 21 April 1894 in The Hague, Holland, and died 23 August 1942 in Auschwitz concentration camp, Poland - Holocaust victim. Resided with family, 1 April 1942: Scheldestraat 85, Den Haag, Holland. 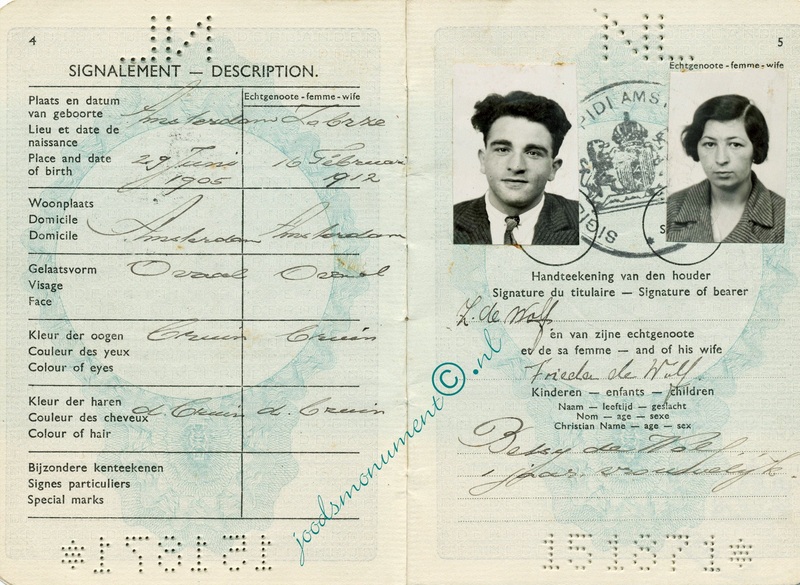 Herman Poons, cashier, and Mietje Hamme, hairdresser, were married on 20 August 1942 in Westerbork transit camp. As witnesses at the wedding ceremony appeared Eva Hamme-Mogendorff, sister-in-law of the bride and Barend Hamme, brother of the bride. 3. SUZE POONS, b. 09 February 1920, The Hague, Holland; d. 11 December 1942, Auschwitz concentration camp, Poland - Holocaust victim. ABRAHAM FRESCO was born 16 May 1887 in The Hague, Holland, and died 12 October 1942 in Auschwitz concentration camp, Poland - Holocaust victim. He married SUSANNA WILKENS 02 April 1913 in The Hague, Holland, daughter of ZADOK WILKENS and DOORTJE SPIERO. She was born 13 August 1884 in The Hague, Holland, and died 12 October 1942 in Auschwitz concentration camp, Poland - Holocaust victim. Resided with family, April 1942: Gedempte Gracht 229, Den Haag, Holland. Belonging to: Abraham Fresco and his family, Den Haag. Front room: table with cloth, chair (4), armchair (2), flower table, radio-cabinet, divan with cover, lace curtain and drape (2), standing clock, mirror, sideboard, floor cloth, carpet, mat, hanging lamp, wall plate (2). Bedroom: double bedstead with bedding, bedside table, linen cupboard, mirror, table, chair (2), cane drying rack, sideboard, wall cupboard, floor cloth, mat, hanging lamp, lace curtain and drape (2). Kitchen: table, gas ring, paraffin burner, kitchenware and house ware, cleaning things, floor cloth, runner, foot mat (2), lace curtain (2). Front room: bedstead with bedding, bedside table, table, chair, sewing basket, hanging lamp, lace curtain and drape (2), floor cloth, mat, mirror. Corridor: chandelier, paraffin stove, drying rack, ironing board. coat hooks, runner, stair carpet with rods. Room: curtain, floor cloth, mat (2). 1. ELIAZAR FRESCO was born 02 September 1915 in The Hague, Holland, and died 30 September 1942 in Auschwitz concentration camp, Poland - Holocaust victim. He married ANNA MELHADO 12 August 1942 in The Hague, Holland, daughter of JOEL MELHADO and AALTJE WALVIS. She was born 29 May 1920 in Rotterdam, Holland, and died 30 September 1942 in Auschwitz concentration camp, Poland - Holocaust victim. 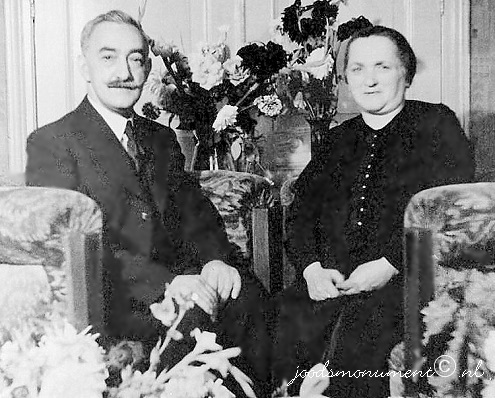 Eliazar Fresco was married in The Hague to Anna Melhado on August 12, 1942. He then moved in with his mother-in-law. Parents of Anna Melhado were JOEL MELHADO born 13 March 1891 in Rotterdam, Holland, and died 13 December 1929 in Rotterdam, Holland. He married AALTJE WALVIS 20 October 1915 in Rotterdam, Holland. She was born 05 June 1892 in Rotterdam, Holland, and died 30 September 1942 in Auschwitz concentration camp, Poland - Holocaust victim. Aaltje Walvis was the daughter of Jonas Walvis and Anna Ossendrijver. Resided, April 1942: Falckstraat 31, Den Haag, Holland. Belonging to: Widow Aaltje Melhado-Walvis and her family, Den Haag. Room: linoleum, carpet, sideboard, tea cupboard, hanging lamp, reclining chair (2), chair (3), table with cloth, lace curtain and drape (2), divan with cover, mirror, flower table. Room: linoleum bed with bedding Room: linoleum chair (2), small table with cloth lace curtain (2), hanging lamp wall cupboard with clothing bed with bedding carpet. Room: small table fold-out bed with bedding and casing, table lamp, lace curtain and drape (2), chair. Kitchen: linoleum, table with cloth, gas ring, chair, wall cupboard with ceramics. Corridor and staircase: runner with rods (2). 2. DOORTJE FRESCO, b. 31 August 1918, The Hague, Holland; d. 24 September 1942, Auschwitz concentration camp, Poland - Holocaust victim. HENRIETTE FRESCO was born 19 May 1889 in The Hague, Holland, and died 25 April 1921 in The Hague, Holland. She married SAMUEL POONS 19 November 1913 in The Hague, Holland, son of ISAAC POONS and BETJE BIJL. He was born 06 March 1875 in The Hague, Holland, and died 02 November 1942 in Auschwitz concentration camp, Poland - Holocaust victim. 2. ISAAC POONS, b. 10 September 1918, The Hague, Holland; d. 16 April 1943, Sobibor death camp, Poland - Holocaust victim. 4. HERMAN POONS, b. 20 October 1920, The Hague, Holland; d. 04 June 1921, The Hague, Holland. EVA FRESCO was born 21 March 1891 in The Hague, Holland, and died 08 October 1942 in Auschwitz concentration camp, Poland - Holocaust victim. She married SALOMON VELLEMAN 10 April 1918 in The Hague, Holland, son of JOSEPH VELLEMAN and DINA DE VRIES. He was born 13 March 1887 in Amsterdam, Holland, and died 08 October 1942 in Auschwitz concentration camp, Poland - Holocaust victim. Resided with family, April 1942: Gedempte Gracht 9, Den Haag, Holland. Parents of Salomon Velleman were JOSEPH VELLEMAN born 31 March 1861 in Leeuwarden, Friesland, Holland, and died 09 July 1943 in Westerbork transit camp, Drenthe, Holland and DINA DE VRIES. He married (1) DINA DE VRIES 24 December 1884 in Amsterdam, Holland. He married (2) JUDIKJE COHEN 29 April 1908 in Amsterdam, Holland. She was born 29 July 1869 in Leeuwarden, Friesland, Holland, and died 23 July 1943 in Sobibor death camp, Poland - Holocaust victim. Photo from his vendor permit, which shows the date of allotment of a permanent standing place per 19 March 1939. Joseph Velleman died on 9 July 1943 in Westerbork transit camp and he was cremated on 12 July 1943. The urn with his ashes was placed on the Jewish cemetery in Diemen on field U, row 10, grave nr. 10. Resided with husband, Joseph Velleman, February 1941: Oude Waal 29 I, Amsterdam, Holland. Belonging to: Joseph Velleman and his family, Amsterdam. 1. JOSEPH VELLEMAN was born 04 August 1921 in The Hague, Holland, and died 31 August 1943 in Central Europe, Municipality unknown - Holocaust victim. He married RIKA POLAK, daughter of ARON POLAK and SARA DE JONGE. She was born 30 October 1921 in The Hague, Holland, and died 08 October 1942 in Auschwitz concentration camp, Poland - Holocaust victim. Parents of Rika Polak were ARON POLAK born 10 September 1889 in The Hague, Holland, and died 08 October 1942 in Auschwitz concentration camp, Poland - Holocaust victim. He married SARA DE JONGE 04 December 1918 in The Hague, Holland. She was born 19 May 1892 in Weener, Leer, Lower Saxony, Germany, and died 08 October 1942 in Auschwitz concentration camp, Poland - Holocaust victim. 2. HERMAN VELLEMAN, b. 06 September 1926, The Hague, Holland; d. 31 August 1943, Central Europe, Municipality unknown - Holocaust victim. 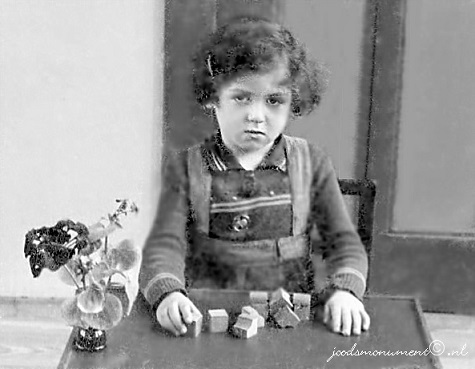 MARIANNE FRESCO was born 09 January 1896 in The Hague, Holland, and died 30 September 1942 in Auschwitz concentration camp, Poland - Holocaust victim. She married MICHIEL WATERMAN 08 January 1919 in Rotterdam, Holland, son of BAREND WATERMAN and SOPHIA DE LEEUW. He was born 05 June 1897 in Rotterdam, Holland, and died 30 September 1942 in Auschwitz concentration camp, Poland - Holocaust victim. Resided with family, April 1942: Van Speykstraat 30 b, Rotterdam, Holland. Parents of Michiel Waterman were BAREND WATERMAN was born 26 April 1871 in Amsterdam, Holland, and died 15 October 1942 in Auschwitz concentration camp, Poland - Holocaust victim. He married SOPHIA DE LEEUW 10 February 1897 in Amsterdam, Holland, daughter of MANUEL DE LEEUW and JETJE DE JONG. She was born 10 April 1879 in Utrecht, Holland, and died 15 October 1942 in Auschwitz concentration camp, Poland - Holocaust victim. Resided with family, May 1940: Batavierenstraat 23, Rotterdam, Holland. Barend Waterman and Sophia de Leeuw had seven children. A son Emmanuel and a son Abram died before the war in 1928 and 1907 respectively. Two children survived the war. The other children were Meijer, Samuel and Michiel. 1. EMANUEL WATERMAN, b. 25 January 1920, Rotterdam, Holland; d. September 1942, Auschwitz concentration camp, Poland - Holocaust victim; m. NAATJE TRIJTEL; b. 29 October 1919, Rotterdam, Holland; d. 07 August 1942, Auschwitz concentration camp, Poland - Holocaust victim. Resided with wife, April 1942: Burgemeester Hoffmanplein 57 a, Holland. 2. BAREND WATERMAN, b. 22 February 1921, Rotterdam, Holland; d. 30 September 1942, Auschwitz concentration camp, Poland - Holocaust victim. KAATJE VAN LEEUWEN was born 29 November 1888 in The Hague, Holland, and died 16 April 1943 in Sobibor death camp, Poland - Holocaust victim. She married ELIAS SPIERO 14 June 1911 in The Hague, Holland, son of NATHAN SPIERO and AALTJE SCHEFFER. He was born 13 June 1890 in The Hague, Holland, and died 16 April 1943 in Sobibor death camp, Poland - Holocaust victim. Resided: Doedijnstraat 1 h, Den Haag, Holland. 1. ALIDA SPIERO was born 29 January 1919 in The Hague, Holland. She married WILLEM KRUL 24 March 1937 in The Hague, Holland, son of PETRUS KROESE and LOUISE KRUL. He was born 13 October 1907 in The Hague, Holland. Adopted his mother`s maiden name after parents were divorced. ARON VAN LEEUWEN was born 19 December 1889 in The Hague, Holland, and died 28 September 1935 in The Hague, Holland. He married ROOSJE VAN KAM 27 August 1919 in The Hague, Holland, daughter of BENJAMIN VAN KAM and JOHANNA HARSCHEL. She was born 13 January 1895 in The Hague, Holland, and died 11 December 1942 in Auschwitz concentration camp, Poland - Holocaust victim. Resided with second husband, Abraham Poons, Fenruary 1941: Bezemstraat 4, Den Haag, Holland. 1. SALOMON VAN LEEUWEN, b. 28 December 1919, The Hague, Holland; d. 30 September 1942, Auschwitz concentration camp, Poland - Holocaust victim. 2. BENJAMIN VAN LEEUWEN, b. 31 March 1921, The Hague, Holland; d. 30 September 1942, Auschwitz concentration camp, Poland - Holocaust victim. ROOSJE VAN KAM married (1) ARON VAN LEEUWEN 27 August 1919 in The Hague, Holland, son of SALOMON VAN LEEUWEN and SIENTJE FRESCO. He was born 19 December 1889 in The Hague, Holland, and died 28 September 1935 in The Hague, Holland. She married (2) ABRAHAM POONS 14 August 1940 in The Hague, Holland. He was born 11 November 1879 in The Hague, Holland, and died 11 December 1942 in Auschwitz concentration camp, Poland - Holocaust victim. 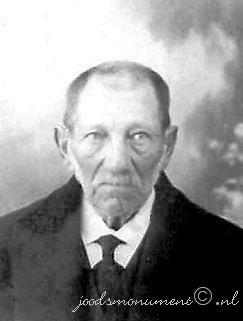 Parents of Roosje van Kam were BENJAMIN VAN KAM born 05 May 1862 in The Hague, Holland, and died 02 April 1943 in Sobibor death camp, Poland - Holocaust victim. He married JOHANNA HARSCHEL 17 September 1890 in The Hague, Holland. She was born 03 September 1860 in The Hague, Holland, and died 27 October 1916 in The Hague, Holland. Resided, April 1942: Israelitisch Oude Mannen- en Vrouwenhuis Newee Sjalom, Neuhuyskade 92-94, Den Haag, Holland. The Israëlitisch Oude Mannen- en Vrouwenhuis Newee Sjalom (Jewish home for elderly men and women Neve Shalom) opened in 1841. In 1929 the residents moved to a new building on the Neuhuyskade, which accommodated over eighty inhabitants plus resident staff. In 1940 the number of patients surged as a result of the arrival of refugees, in part from Rotterdam after that city was bombed. By October 1942 there were 121 patients. Because they did not all fit in the building on the Neuhuyskade, annexes were rented on the Daendelsstraat, the Amalia van Solmsstraat, the Tweede Emmastraat and the Surinamestraat in The Hague. MIETJE FRESCO was born 31 January 1887 in The Hague, Holland, and died 09 April 1943 in Sobibor death camp, Poland - Holocaust victim. She married KALMAN POONS 22 August 1917 in The Hague, Holland, son of MOZES POONS and BETJE VAN RIJS. He was born 24 September 1881 in The Hague, Holland, and died 09 April 1943 in Sobibor death camp, Poland - Holocaust victim. Resided with family, April 1942: Van Ravesteinstraat 75 r, Den Haag, Holland. 1. MOZES MAURITS POONS, b. 16 November 1918, The Hague, Holland; d. 14 June 1937, The Hague, Holland. SIMON FRESCO was born 25 May 1890 in The Hague, Holland, and died September 1944 in Blechhammer: Sub-camp of Auschwitz III - Monowitz, Poland - Holocaust victim. He married DORA VAN RIJS 06 January 1915 in The Hague, Holland, daughter of ABRAHAM VAN RIJS and REBECCA HAKKER. She was born 19 November 1888 in The Hague, Holland, and died May 1944 in Auschwitz concentration camp, Poland - Holocaust victim. Resided with wife, April 1942: Boekhorststraat 125, Den Haag, Holland. The Jokos file reveals that a claim was lodged for compensation for valuables surrendered to the Lippmann-Rosenthal looting bank (L-claim, number 3608/15179). Blechhammer was established in April 1942 near Kozle, a town 18.5 miles (30 km) west of Gliwice, Poland. Blechhammer was initally a labor camp for Jews. The original 350 prisoners built a synthetic gasoline plant.for the Oberschlesische Hydriewerke (Upper Silesia Hydrogenation Works). When 120 prisoners contracted typhus, they were transferred to Auschwitz, where they were killed. That June the remaining prisoners were transferred to a new and larger camp that had been built nearby. The camp was populated primarily by Jews from Upper Silesia, however, among the 5,500 prisoners were people from 15 different countries. They were housed in wooden barracks under appalling conditions, with no toilet or washing facilities. Some 200 female Jewish prisoners were put into a separate section of the camp. Hunger and disease were rife, especially diarrhea and tuberculosis. A crematorium was built, in which were cremated the bodies of 1,500 prisoners who had died from "natural" causes or had been killed. On January 21, 1945, 4,000 prisoners, including 150 women, were taken out of the camp and put on a death march lasting 13 days. Several dozen prisoners who tried to hide in Blechhammer during the evacuation were discovered and killed on the spot. 1. SERA FRESCO was born 18 November 1916 in The Hague, Holland, and died 26 September 1944 in Auschwitz concentration camp, Poland - Holocaust victim. She married EMANUEL (MAX) POLAK 15 May 1941 in The Hague, Holland, son of JOEL POLAK and REBECCA HAKKER. He was born 21 May 1914 in The Hague, Holland, and died 04 March 1998 in Amstelveen, Amsterdam, Holland. Parents of Enanuel (Max) Polak were JOEL POLAK born 17 June 1881 in The Hague, Holland, and died 12 September 1934 in The Hague, Holland. He married REBECCA HAKKER 06 June 1906 in The Hague, Holland, daughter of SALOMON HAKKER and RACHEL KLOOT. She was born 23 May 1879 in The Hague, Holland, and died 05 March 1943 in Sobibor concentration camp, Poland - Holocaust victim. Resided, April 1942: Harstenhoekweg 127, Scheveningen, Holland. SIMON HAKKER was born 11 May 1901 in The Hague, Holland, and died 28 May 1943 in Auschwitz concentration camp, Poland - Holocaust victim. He married ROSETTE VAN DAM 16 September 1925 in The Hague, Holland, daughter of ARNOLD VAN DAM and THERESIA BARENDSE. She was born 24 December 1902 in The Hague, Holland, and died 28 May 1943 in Sobibor death camp, Poland - Holocaust victim. Resided with family, April 1942: Vondelstraat 238, Den Haag, Holland. The Jokos file reveals that a claim was lodged for compensation for valuables surrendered to the Lippmann-Rosenthal looting bank (L-claim, number 4643/7549). 1. MOZES HAKKER, b. 03 August 1926, The Hague, Holland; d. 03 September 1940, The Hague, Holland. Parents of Rosette van Dam were ARNOLD VAN DAM born 18 January 1870 in Rotterdam, Holland, and died 07 May 1943 in Sobibor death camp, Poland - Holocaust victim. He married THERESIA BARENDSE 28 August 1895 in Rotterdam, Holland. She was born 17 December 1877 in Rotterdam, Holland, and died 28 May 1943 in Sobibor death camp, Poland - Holocaust victim. Resided with family, April 1942: Van Bassenstraat 96, Den Haag, Holland. BAREND HAKKER was born 30 August 1902 in The Hague, Holland, and died 21 May 1943 in Sobibor death camp, Poland - Holocaust victim. He married ALIDA BOBBE 28 December 1927 in The Hague, Holland, daughter of MOSES BOBBE and GRIETJE POONS. She was born 25 April 1903 in The Hague, Holland, and died 25 January 1943 in Auschwitz concentration camp, Poland - Holocaust victim. Resided with family, April 1942: Scheldestraat 109, Den Haag, Holland. Parents of Alida Bobbe were MOSES BOBBE born 13 February 1872 in The Hague, Holland, and died 26 January 1943 in Auschwitz concentration camp, Poland - Holocaust victim and GRIETJE POONS. Moses married (1) GRIETJE POONS 04 April 1894 in The Hague, Holland. She was born 25 May 1871 in The Hague, Holland, and died 20 October 1919 in The Hague, Holland. He married (2) JETJE WILKENS 19 January 1921 in The Hague, Holland. She was born 25 September 1883 in The Hague, Holland, and died 26 January 1943 in Auschwitz concentration camp, Poland - Holocaust victim. Resided with second wife, Jetje Wilkens, April 1942: Hoefkade 903, Den Haag, Holland. 1. MAURITS HAKKER, b. 29 March 1929, The Hague, Holland; d. 21 May 1943, Sobibor death camp, Poland - Holocaust victim. 2. SIMON HAKKER, b. 24 February 1933, The Hague, Holland; d. 21 May 1943, Sobibor death camp, Poland - Holocaust victim. BETJE HAKKER was born 03 May 1911 in The Hague, Holland, and died 16 April 1996 in Weesp, Holland. She married LEOPOLD TURKSMA 26 June 1946 in The Hague, Holland, son of ISIDOR TURKSMA and THEODORA EISMANN. He was born 25 August 1905 in Nijmegen, Holland, and died 09 February 1987 in The Hague, Holland. Parents of Leopold Turksma were ISIDOR TURKSMA born 27 January 1872 in Venlo, Limburg, Holland, and died 27 February 1939 in The Hague, Holland. He married THEODORA EISMANN 18 September 1904 in Nijmegen, Holland. She was born 09 August 1874 in Venlo, Limburg, Holland, and died 09 April 1943 in Sobibor death camp, Poland - Holocaust victim. Resided with relatives, April 1942: Falckstraat 107, Den Haag, Holland. HANNA FRESCO was born 16 March 1906 in The Hague, Holland, and died 19 October 1942 in Auschwitz concentration camp, Poland - Holocaust victim. She married ISAAC COHEN 20 August 1930 in The Hague, Holland, son of MOZES COHEN and GRIETJE COSMAN. He was born 12 July 1905 in The Hague, Holland, and died 07 February 1945 in Gross-Rosen concentration camp, Rogoznica, Poland – Holocaust victim. Resided with family, April 1942: Berberisstraat 20, Den Haag, Holland. Belonging to: Isaac Cohen and his family, Den Haag. Living room: lace curtains (4), drapes (2), lamp, small statue (4), oak built-in bookshelves, oak table, oak chair (4), oak armchair (2), sideboard, flower table (2), basket, electric clock, built-in cupboard with rags, built-in cupboard with china dinner set, cane mat. Bedroom: lace curtains (6), drapes (4), oak double bed with mattress and pillows, oak bedside table (2), oak dressing table with mirror, oak cupboard with linen, linoleum. Small front room: lace curtains (2), oak fold-out bed, wooden book case, cot with mattress. Isaac Cohen left for Westerbork transit camp three months earlier than his wife and children. According to someone living nearby, the family was betrayed by neighbours. The Nazis established Gross-Rosen on the 2 August 1940 in Lower Silesia as a satellite camp of Sachsenhausen in the vicinity of the granite quarry of Gross-Rosen. On 1 May 1941 Gross-Rosen became an independent concentration camp; it remained in operation until mid-February 1945. 1. GRETHA COHEN, b. 15 September 1931, The Hague, Holland; d. 19 October 1942, Auschwitz concentration camp, Poland - Holocaust victim. 2. JACOB COHEN, b. 10 August 1935, The Hague, Holland; d. 19 October 1942, Auschwitz concentration camp, Poland - Holocaust victim. ABRAHAM FRESCO was born 20 June 1903 in The Hague, Holland, and died 19 November 1942 in Auschwitz concentration camp, Poland - Holocaust victim. He married DEBORA ENGELSMAN 08 May 1928 in Amsterdam, Holland, daughter of GODSCHALK ENGELSMAN and MARIANNE DE GOEDE. She was born 29 November 1901 in Amsterdam, Holland, and died 19 November 1942 in Auschwitz concentration camp, Poland - Holocaust victim. Abraham Fresco was a Dutch painter and a Jewish victim of the Holocaust. Fresco`s work can be seen in the Jewish Historical Museum, Amsterdam, Holland and are often displayed at exhibitions and auctions. Abraham Fresco was the son of Leon Fresco and Margaretha Blitz. At primary school it was noticed that Abraham Fresco had a talent for drawing and on the advice of his teachers, he went to the Royal Academy of Art in The Hague. Later he attended the Royal Academy of Arts in Amsterdam, where he was taught by Johannes Hendricus Jurres , Antoon Derkinderen and Nicolaas van der Waay . He then returned to The Hague and established himself as a painter. In 1928, Abraham Fresco attracted attention when the Joodse weekblad (Jewish weekly) "The Friday Night" gave publicity to his work in an article by Michel Danvers. Danvers described him as a very modest, serious, hard-working young man, aware of his shortcomings, and with none of the snobbery of many young artists. He predicted a great future Fresco. Abraham Fresco worked as a portrait painter, but then focused more emphatically on genre paintings, including landscapes, still life’s and especially cityscapes. He often worked in Scheveningen and The Hague, but also in other places in the Netherlands and Belgium. There he painted both stilled as bustling shopping plazas and performances of folk festivals, always characterized by a bold, impressionistic brushwork and a remarkably strong colouration. 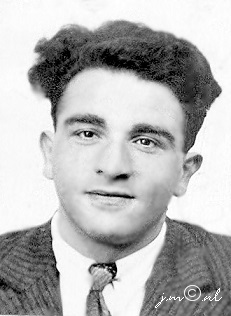 Abraham Fresco married in 1928 to Debora Engelsman, with whom he had a daughter, Margaretha Fresco, in 1929: As Jews, the whole family were arrested in 1942 and deported. On November 19, 1942, Abraham, his wife Debora and daughter, Margaretha, were immediately murdered on their arrival to the Auschwitz concentration camp. Room: lace curtain (2), hanging lamp, small statue (9), sideboard with knick-knacks, oak double bed with casing and bedding, wardrobe (2), flower table, stove, coal-box, smoker's table, loudspeaker, upholstered chair (7), round table, carpet, runner. Room: lace curtain (4), hanging lamp, small statue (13), stove, oak bed with mattress, child seat, small table (2), chair (2), meeting table, wall cupboard, photographs (9), floor cloth. Room: lace curtain (2), drape (2), bookcase, children's cupboard, iron bed with mattress, child seat, small children's table, floor cloth, mat. Kitchen: lace curtain (2), gas cooker, wall cupboard (2), kitchenware, table (2), chair, vacuum cleaner, floor covering. Corridor: hanging lamp, clothing rail, floor cloth, carpet, mat. Parents of Debora Engelsman were GODSCHALK ENGELSMAN born 17 November 1869 in Amsterdam, Holland, and died 03 August 1922 in The Hague, Holland. He married MARIANNE DE GOEDE 09 May 1889 in Amsterdam, Holland. She was born 25 December 1865 in Amsterdam, Holland, and died 19 January 1942 in Amsterdam, Holland. Resided: Stadhouderskade 108 boven, Amsterdam, Holland. Burial: 21 January 1942, Muiderberg cemetery, Ouderkerk-on-the-Amstel, Holland. 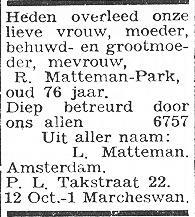 In January 1942, an obituary was placed in Het Joodsche Weekblad for Marianne Engelsman-de Goede. As of 26 October 1941, all Jewish periodicals were prohibited, except for Het Joodsche Weekblad. A.J. Herzberg was the executive editor. In addition to articles about social and religious matters, the paper disclosed Nazi regulations concerning Jews and Jewish affairs. Everything published in the paper was screened and censored by the Nazi authorities first, which they later nicknamed; the Jew Cull. By September 1943 the readers had disappeared, and the paper was discontinued. 1. MARGARETHA FRESCO, b. 15 February 1929, The Hague, Holland; d. 19 November 1942, Amsterdam, Holland. MEIJER PRINS was born 02 December 1892 in The Hague, Holland, and died 07 May 1943 in Sobibor death camp, Poland - Holocaust victim. He married ADRIANA ALBERTA JACOBA VAN DER WORFF. She was born 09 February 1898 in Rilland-Bath, Zeeland. SAARTJE PRINS was born 04 May 1894 in The Hague, Holland, and died 22 October 1942 in Auschwitz concentration camp, Poland - Holocaust victim. She married SAMUEL VAN DER KLOOT 13 October 1926 in The Hague, Holland, son of SAMUEL KLOOT and MARIANNE LENS. He was born 04 December 1896 in The Hague, Holland, and died 28 February 1943 in Auschwitz concentration camp, Poland - Holocaust victim. Parents of Samuel van der Kloot were SAMUEL VAN DER KLOOT born 03 September 1859 in The Hague, Holland, and died 13 November 1942 in Amsterdam, Holland. He married MARIANNE LENS 04 May 1881 in The Hague, Holland. She was born 07 March 1858 in The Hague, Holland, and died 30 June 1918 in The Hague, Holland. Resided, 1942: Israelitisch Oude Mannen- en Vrouwenhuis Newee Sjalom, Neuhuyskade 92-94, Den Haag, Holland. On 31 October 1942 the Neuhuyskade premises were vacated on Nazi orders. After many meanderings, the elderly were provided with temporary accommodations in a building at 52 Rapenburgerstraat in Amsterdam, which had previously housed a kindergarten. On 22 March 1943 all elderly residents and staff were removed from these premises, taken to Westerbork and subsequently deported to Eastern Europe. 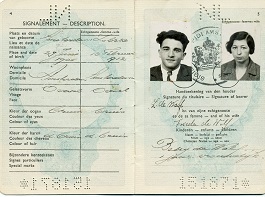 Resided with wife, April 1942: Hoefkade 14, Den Haag, Holland. 1. SAMUEL VAN DER KLOOT, b. 02 June 1932, The Hague, Holland; d. 30 April 1943, Sobibor death camp, Poland - Holocaust victim. Resided: Care center Willem van den Bergh, residential care centre for persons with a mental handicap, Zwarteweg 20, Noordwijk, Holland. EMANUEL PRINS was born 31 March 1898 in The Hague, Holland, and died 31 March 1944 in Auschwitz concentration camp, Poland - Holocaust victim. He married HENDRIKA POONS 18 January 1928 in The Hague, Holland, daughter of SALOMON POONS and SAARTJE POONS. She was born 18 March 1905 in The Hague, Holland, and died 19 October 1942 in Auschwitz concentration camp, Poland - Holocaust victim. Parents of Hendrika Poons were SALOMON POONS born 08 November 1863 in The Hague, Holland, and died 04 December 1940 in Wassenaar, The Hague, Holland. He married SAARTJE POONS 10 November 1886 in The Hague, Holland. She was born 28 February 1865 in The Hague, Holland, and died 19 October 1942 in Auschwitz concentration camp, Poland - Holocaust victim. Resided with family, April 1942: Gedempte Gracht 55, Den Haag, Holland. 1. SOPHIE PRINS, b. 17 April 1931, The Hague, Holland; d. 19 October 1942, Auschwitz concentration camp, Poland - Holocaust victim. LOUIS PRINS was born 07 February 1900 in The Hague, Holland, and died 21 May 1943 in Sobibor death camp, Poland - Holocaust victim. He married RACHEL ESTER FULD 17 December 1930 in The Hague, Holland, daughter of LOUIS FULD and BETSY POONS. She was born 20 May 1908 in The Hague, Holland, and died 21 May 1943 in Sobibor death camp, Poland - Holocaust victim. Resided with family, April 1942: Tullinghstraat 51, Den Haag, Holland. Louis Prins was the son of Philip Prins and Sophia Fresco. His first marriage, which he concluded on 4 August 1926 had been dissolved by divorce on 19 April 1927. Louis married again in Den Haag on 17 December 1930 to Rachel Ester Fuld, daughter of Louis Jacob Fuld and Elizabeth Poons. The couple had four children together: Filip, (who has survived the Holocaust), Elizabeth, Max and the little Louis who was born in January 1943. 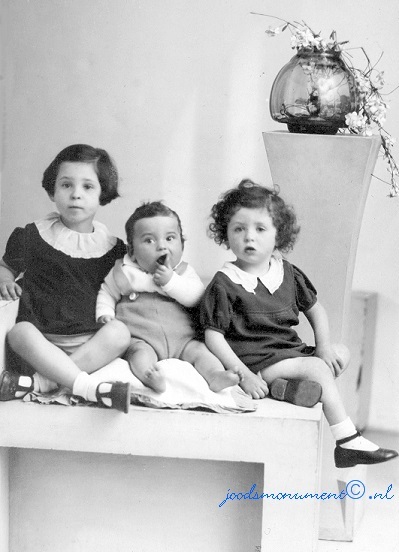 The Louis Prins family - 8 August 1942: his wife Rachel (Shelly) Fuld in the middle and at her left side daughter Elizabeth (Beppie) and at the right side son Max. 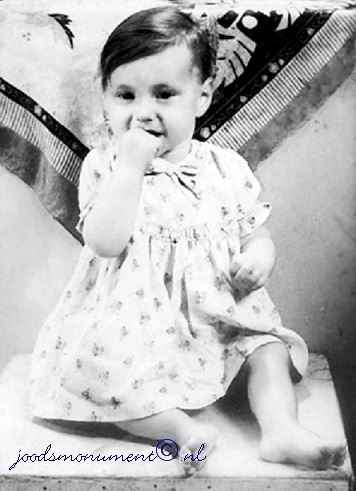 Rachel was expecting their son Louis at the time, who was born in January 1943 and murdered only 3 months later for whom there is no picture. Parents of Rachel Esther Fuld were LOUIS FULD born 21 November 1878 in The Hague, Holland, and died 01 February 1943 in Auschwitz concentration camp, Poland - Holocaust victim. He married BETSY ELISABETH POONS 12 April 1905 in The Hague, Holland. She was born 20 October 1883 in Memphis, Shelby County, Memphis, Tennessee, USA, and died 01 February 1943 in Auschwitz concentration camp, Poland - Holocaust victim. Resided with family, 1 April 1942: Merwedestraat 26, Den Haag, Holland. Belonging to: Louis Jacob Fuld and his family, Den Haag. 2. ELISABETH PRINS, b. 06 April 1933, The Hague, Holland; d. 21 May 1943, Sobibor death camp, Poland - Holocaust victim. 3. MAX PRINS, b. 03 June 1936, The Hague, Holland; d. 21 May 1943, Sobibor death camp, Poland - Holocaust victim. 4. LOUIS PRINS, b. 28 January 1943, The Hague, Holland; d. 21 May 1943, Sobibor death camp, Poland - Holocaust victim. BAREND PRINS was born 03 January 1906 in The Hague, Holland, and died 21 May 1943 in Sobibor death camp, Poland - Holocaust victim. He married NAATJE MELHADO 31 May 1939 in The Hague, Holland, daughter of JONAS MELHADO and SAARTJE WALVIS. She was born 13 February 1913 in Rotterdam, Holland, and died 02 July 1943 in Sobibor death camp, Poland - Holocaust victim. Parents of Naatje Melhado were JONAS MELHADO born 13 January 1888 in Rotterdam, Holland, and died 21 January 1945 in Blechhammer (Auschwitz IV), Labour camp, Poland. He married SAARTJE WALVIS 02 September 1908 in Rotterdam, Holland. She was born 17 September 1887 in Rotterdam, Holland, and died 09 April 1943 in Sobibor death camp, Poland - Holocaust victim. 1. SAARTJE PRINS, b. 09 May 1942, The Hague, Holland; d. 14 May 1943, Westerbork transit camp, Drenthe, Holland. Saartje Prins died on 14 May 1943 in Westerbork transit camp and she was cremated on the same day. The urn with her ashes was placed on the Jewish cemetry in Diemen on field U, row 5, grave nr. 15. BENJAMIN FRESCO was born 03 June 1907 in The Hague, Holland, and died 13 July 1939 in The Hague, Holland. He married ELISABETH CATHARINA MARIA VAN DER HOUVEN 06 August 1930 in The Hague, Holland, daughter of JOHANNES HOUVEN and CATHARINA LAMBOO. She was born 09 January 1913 in The Hague, Holland, and died 28 June 2006 in The Hague, Holland. Mutual cousins to all members of the Sasieni/Sassienie family. BAREND FRESCO was born 25 Apr 1890 in The Hague, Holland, and died 13 Jan 1943 in Mauthausen-Gusen Concentration Camp, Mauthausen, Austria. He married (1) SAARTJE BEGO 04 Sep 1912 in The Hague, Holland, daughter of JACOB BEGO and HADASSE DE GROOT. She was born 02 Jun 1887 in The Hague, Holland, and died 19 May 1936 in The Hague, Holland. He married (2) NAATJE BOEKBINDER 17 Feb 1937 in The Hague, Holland, daughter of MOSES BOEKBINDER and MIETJE VAN LEEUWEN. She was born 22 May 1898 in The Hague, Holland, and died 09 Oct 1988 in Amsterdam, Holland. 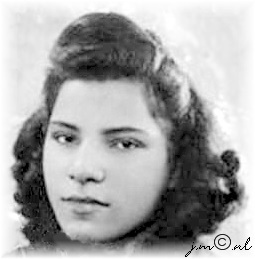 Resided, April 1942: Hobbemaplein 64, Den Haag, Holland. Parents of Naatje Boekbinder were MOSES BOEKBINDER born 14 Nov 1865 in The Hague, Holland, and died 26 Feb 1943 in Auschwitz concentration camp, Poland - Holocaust victim and MIETJE VAN LEEUWEN. He married (1) MIETJE VAN LEEUWEN 22 Aug 1894 in The Hague, Holland. She was born 22 May 1869 in The Hague, Holland, and died 19 Aug 1898 in The Hague, Holland. He married (2) JUDITH ROET 07 Nov 1900 in Amsterdam, Holland. She was born 15 Apr 1871 in Amsterdam, Holland, and died 26 Feb 1943 in Auschwitz concentration camp, Poland - Holocaust victim. Resided with family, April 1942: Sint Jacobstraat 183, Den Haag, Holland. Belonging to Moses Boekbinder and his family, Den Haag. 1. JACOB FRESCO, b. 08 May 1913, The Hague, Holland; d. 27 Mar 1944, Auschwitz concentration camp, Poland - Holocaust victim. 2. MOZES FRESCO, b. 15 May 1914, The Hague, Holland; d. 24 May 1914, The Hague, Holland. 3. EMANUEL (MAX) FRESCO, b. 04 Jul 1916, The Hague, Holland; d. 30 Sep 1942, Auschwitz concentration camp, Poland - Holocaust victim; m. SOPHIE SANTEN, 15 Feb 1939, The Hague, Holland; b. 19 Aug 1919, Amsterdam, Holland; d. 30 Sep 1942, Auschwitz concentration camp, Poland - Holocaust victim. Resided with wife, April 1942: Hobbemastraat 146, Den Haag, Holland. Parents of Sophie Santen were BAREND SANTEN born 01 Jul 1882 in Amsterdam, Holland, and died 02 Feb 1938 in The Hague, Holland. He married REBECCA JACOBS 20 Aug 1902 in Amsterdam, Holland. She was born 23 Jul 1883 in Amsterdam, Holland, and died 12 Feb 1943 in Auschwitz concentration camp, Poland - Holocaust victim. Resided: Paulus Potterstraat 118, Den Haag, Holland. 4. MIETJE FRESCO, b. 13 Jun 1918, The Hague, Holland; d. 23 Aug 1942, Auschwitz concentration camp, Poland - Holocaust victim. 5. HADASSA (DAATJE) FRESCO was born 17 Aug 1920 in The Hague, Holland, and died 15 Dec 1942 in Auschwitz concentration camp, Poland - Holocaust victim. She married SIMON GRONINGEN VAN SCHINKEL 28 Feb 1940 in The Hague, Holland, son of SIMON VAN SCHINKEL and MARGARETHA HAASE. He was born 29 May 1913 in The Hague, Holland, and died 31 Jul 1990 in Enschede, Overijssel, Holland. Resided with husband, April 1942: Stortstraat 30, Den Haag, Holland. Belonging to Simon Groningen van Schinkell and his family, Den Haag. Room: table, round table, paraffin burner, chair (2), bicycle, lace curtains, worthless items. 6. 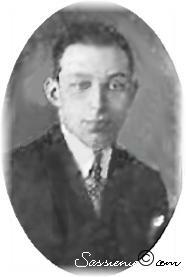 ELIASER FRESCO, b. 21 Sep 1928, The Hague, Holland; d. 20 Dec 2007, Leiden, Holland. JACOB FRESCO was born 08 May 1913 in The Hague, Holland, and died 27 Mar 1944 in Auschwitz concentration camp, Poland - Holocaust victim. He married NEELTJE MOS 12 Jun 1940 in The Hague, Holland, daughter of MAARTEN MOS and ADRIANA PRONK. She was born 09 Oct 1915 in Scheveningen, The Hague, Holland, and died 27 Feb 1985 in Wassenaar, The Hague, Holland. Resided, April 1942: Middelburgschestraat 12, Scheveningen, Holland. Wife has survived the war. MIETJE FRESCO was born 13 Jun 1918 in The Hague, Holland, and died 23 Aug 1942 in Auschwitz concentration camp, Poland - Holocaust victim. She married HIJMAN BOBBE 28 Oct 1936 in 23 Aug 1942, son of SAMUEL BOBBE and MARIEKA KAMPYON. He was born 10 Dec 1916 in The Hague, Holland, and died 21 Sep 1942 in Auschwitz concentration camp, Poland - Holocaust victim. Resided with family, April 1942: Geleenstraat 58, Den Haag, Holland. Parents of Hijman Bobbe were SAMUEL BOBBE born 19 Jul 1882 in The Hague, Holland, and died 21 Jan 1943 in Auschwitz concentration camp, Poland - Holocaust victim. He married MARIEKA KAMPYON 28 May 1902 in The Hague, Holland. She was born 16 Aug 1879 in Winschoten, Oldambt, Groningen, Holland, and died 20 May 1941 in The Hague, Holland. Resided with family, April 1, 1942: Nieuwe Haven 35, Den Haag, Holland. Samuel Bobbe was the son of Salomon Bobbe (died in 1921) and Sophia Kloot (died in 1912). The couple had six children: Sophia (died in 1914), Salomon, Hijman, Simon and two children who survived the war. Belonging to Samuel Bobbe and his family, Den Haag. Room: lace curtain (2), drape (4), wall mirror, wall plate (2), hanging lamp, sideboard with glass set and groceries, oil painting (3), tea table with tea set, small table, mantelpiece runner, wall clock, vase (2), fireplace with plate, flower table, table lamp, newspaper holder, table with cloth, easy chair (2), chair (4), chandelier, carpet, floor cloth. Room: lace curtain and drape (2), wall mirror, wall plate (10), hanging lamp, mantelpiece runner, sideboard with dinner set, small table, flower table, easy chair (2), chair (4), table with cloth, carpet, floor cloth. Room: lace curtain and drape (2), hanging lamp, wall plate (9), cupboard with ladies' clothing, linen cupboard with linen, double bed with bedding, bedside table (2), alarm clock, small table with cloth, chair (2), mat (2), floor cloth. Kitchen: lace curtain (2), wall mirror, scales, gas ring, spice rack, coffee grinder, vacuum cleaner ("Excelsior"), iron, chair, table with cloth, hanging lamp, wall cupboard. Room: lace curtain, wall plate (8), hanging lamp, medicine cupboard with ,medicines, cupboard with knick-knacks, bed with bedding, floor cloth. Corridor: hanging lamp, brush hanger, coat hooks, wall plate (4), wall cupboard, runner with rods, coconut runner. Attic: double bed, tub (2), coal (sack) (5), worthless items. 1. SAARTJE BOBBE, b. 06 Jun 1937, The Hague, Holland; d. 23 Aug 1942, Auschwitz concentration camp, Poland - Holocaust victim. 2. MARIEKA BOBBE, b. 22 Jun 1941, The Hague, Holland; d. 23 Aug 1942, Auschwitz concentration camp, Poland - Holocaust victim. ELIASER FRESCO was born 21 Sep 1928 in The Hague, Holland, and died 20 Dec 2007 in Leiden, Holland. He married PETRONELLA HERBERDINA VAN ASPEREN, daughter of HERBERT VAN ASPEREN and CHRISTINA WILLEMSEN. She was born 05 Apr 1924 in The Hague, Holland, and died 31 Dec 2010 in Leiderdorp, Holland. 1. CHRISTINA FRESCO, b. 19 Mar 1952, The Hague, Holland; d. 10 Apr 1952, The Hague, Holland.